This fall is shaping up to be an amazing season so far. I’ve done some baking, I’ve got my blogging back on, and I can’t even begin to describe how freakin’ excited I am for Thanksgiving this year! The quintessential “day of turkey” is one week away and I’ve spent most of the weekend sticky-noting recipes and planning the menu for my family’s Thanksgiving dinner, not to mention packing as much foodie goodness as I can into the holiday weekend with my boyfriend, family and friends. While I do have pumpkins and apples (cooked and baked because of my raw fruit allergy!) and squash on the brain, part of me knows it’s still waaaay too early to be in full comfort food mode. We have plenty of time for that in the dreaded “w” word in the coming months! Fall food is so inviting because it incorporates both cozy comfort with bright and fresh flavours: fruit and veg soups, bean and vegetable salads with comforting herbs, fruity vinaigrettes and dressings, and tender meats with root vegetables and juicy cooked fruit. I love how the weather is cool but still pleasantly balmy on days and how I can still enjoy the lighter fare without sweating to death and hiding from the fierce sun like I do during the summer! Which brings me to a teeny confession I have to make: this post and these photos were supposed to be on Ate by Ate over a month ago. Possibly even 2 months ago. But life happened and this post just never did. Long story short, Yorkville Espresso Bar owners Rita and Tony invited me to the cafe for return visit to share a meal, to watch chef John Vetere cook and work his magic on the cafe’s many delicious menu items in the kitchen studio, to try some of the cafe’s various gluten-free bakery items from coffee and baking master Drew Randall and to basically talk food, blogging and community. It was such a fun day and it was such a cool experience seeing the cafe menu items that make us drool come to life right before my eyes. 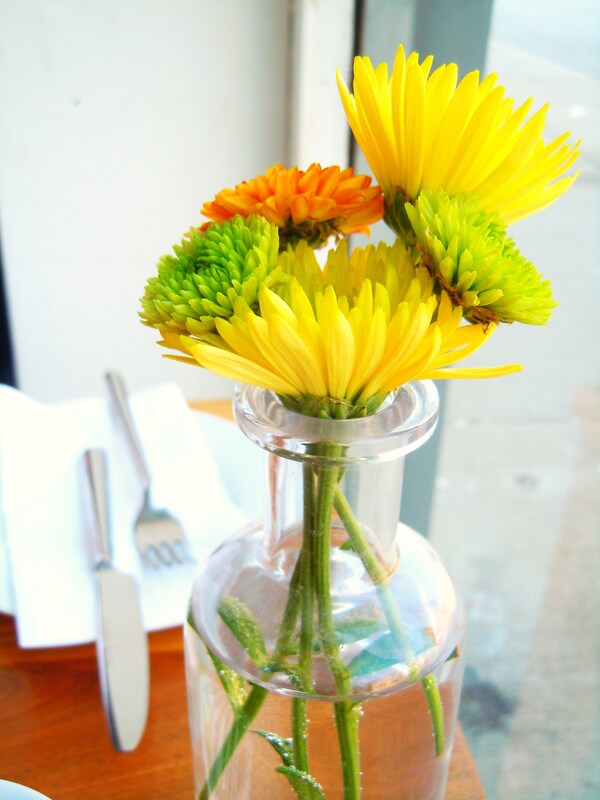 These photos were taken at Yorkville Espresso Bar during the summer and part of me worried that I wouldn’t be able to make them relevant for fall. Thankfully for me, their food is just as perfect for fall as it is for summer and I’m just happy I finally get to share with you guys! 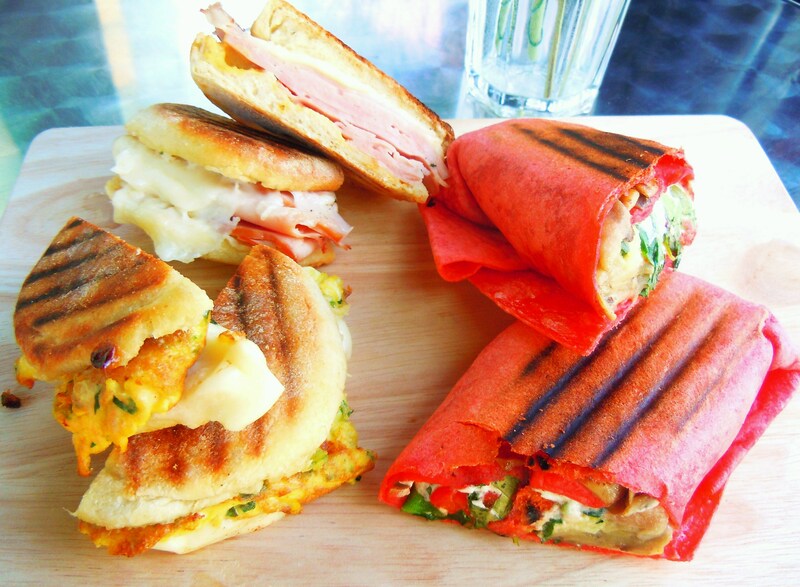 Yorkville Espresso Bar has introduced a number of different breakfast and lunch foods to their ever-expanding menu: frittata sandwiches oozing with eggs, herbs, veggies and cheese (oh and ham! 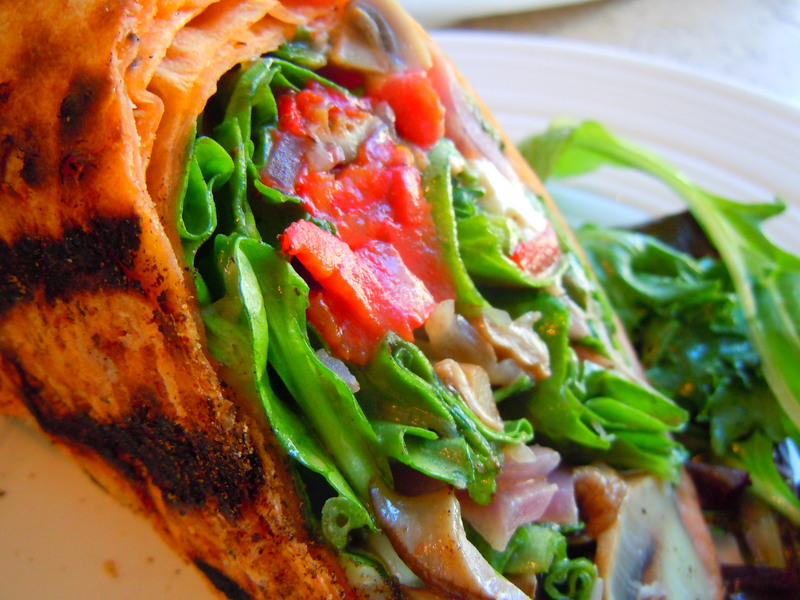 ), scrumptious wraps with creamy cheese and fresh vegetables, and a plethora of hearty but bright salads. Aside from how yummy everything is, what makes the food so enticing to me is the price point. Being located in Yorkville doesn’t exactly give you the reputation of being inexpensive. Let’s face it, Yorkville isn’t known as Mink Mile for nothing; its poshness extends to the dining scene too. 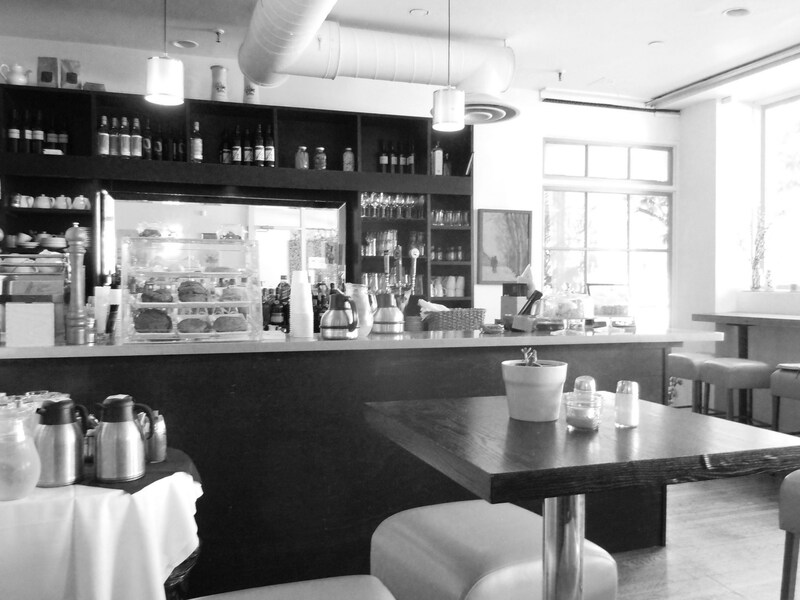 But Yorkville Espresso Bar has made their dishes and food so accessible by making it healthy, fresh and affordable. 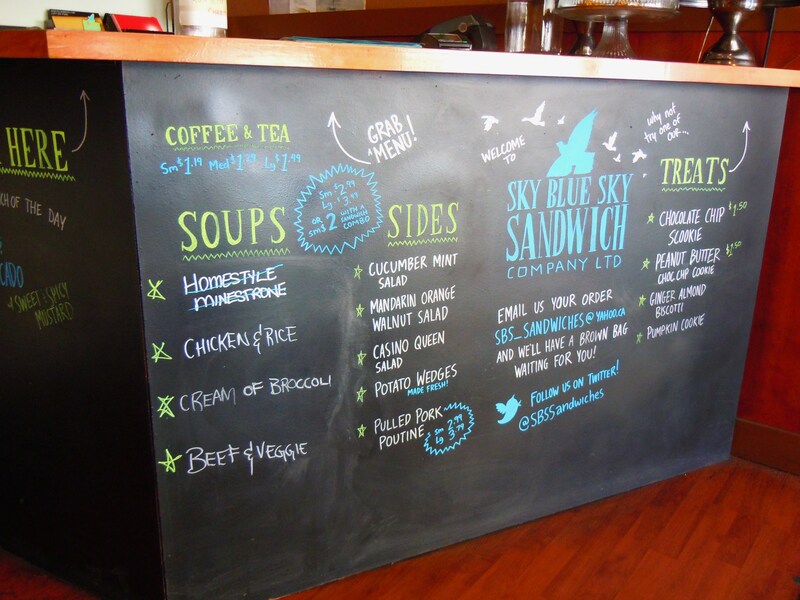 You have the frittata sandwiches and salads coming in at $4 and $4.50 respectively (under $5!) and their ginourmous wraps and artisan bread sandwiches coming in under $10 at $8. Their food menu is a reflection of what folks in and around the community have asked for; Rita and Tony and their staff have taken so much of everyone’s feedback to heart and have put an enormous amount of thought and care into their menu, offering healthy food that isn’t run of the mill (nobody needs a limp lettuce and tomato salad that was packaged the day before thank you very much), made the morning of, and perfect for both dine-in and grab-and-go for the work crowd. Their food menu includes herb roasted chicken wraps with crunchy celery and sunflower seeds, Thai tuna with basmati rice, and shaved carrots dressed in chili sauce, Italian meatball and mozzarella and rapini on toasted artisan bread and even Trinidadian doubles among other savouries alongside the mountain of baked goods and gluten-free items such as biscotti, muffins, pastries, tarts, scones, brownies, loaf cakes, macarons and more. 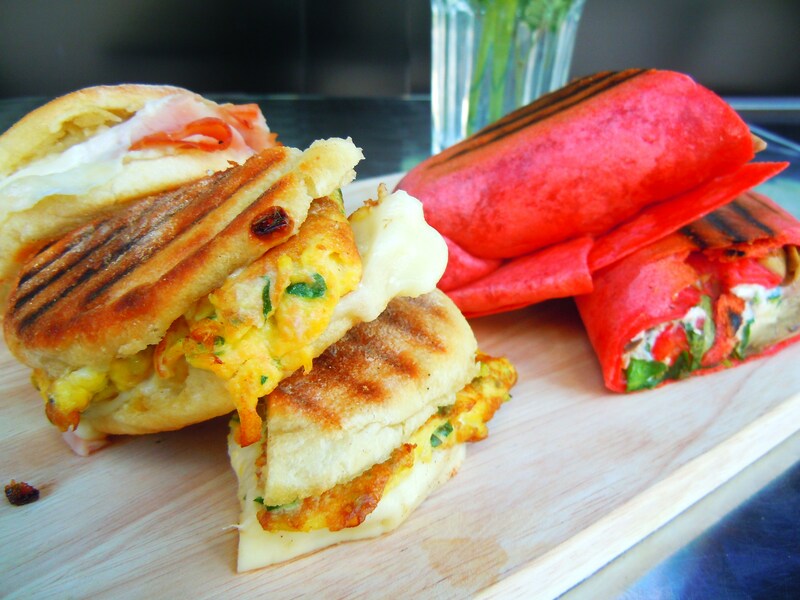 What we have here are toasted and grilled English muffin frittata sandwiches stuffed with eggs, mozzarella, provolone and basil along with ham and cheese sandwiches, grilled sun-dried tomato wraps stuffed with creamy goat cheese, roasted red peppers, zucchini, eggplant, greens and mushrooms and two amazing, fantastic salads: white beans infused with fresh sprigs of rosemary with edamame, avocado and red onion vinaigrette and an artichoke salad with grape tomatoes, olives, arugula, Parmigiano-Reggiano cheese, finished with a red wine vinaigrette. 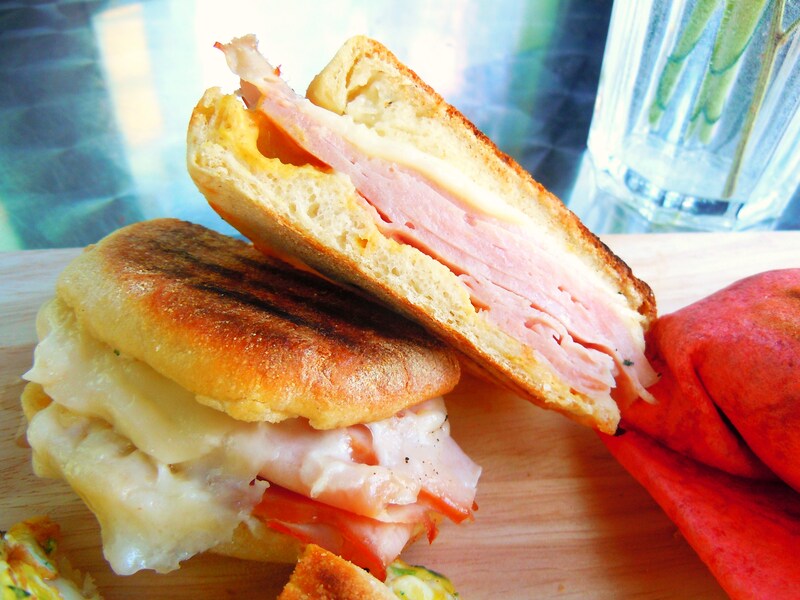 I love English muffin sandwiches like nobody’s business. At home, I toast English muffins and eat them with cream cheese and nothing else at times. Yorkville Espresso Bar does a special daily frittata sandwich each morning and on this day my tastebuds were treated to two of my favourite things enveloped in eggs: cheese and basil. It makes my stomach growl just thinking about it. 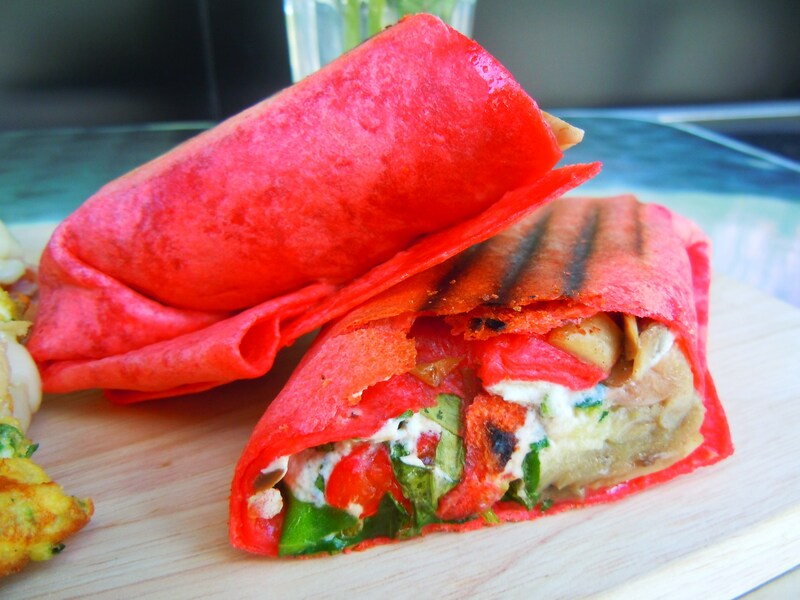 Next, we have the sun-dried tomato wrap. This thing is HUGE. I was watching chef John make it while I was taking photos in the Kitchen Studio and I was all bug-eyed when I saw the size of tortilla he was using! 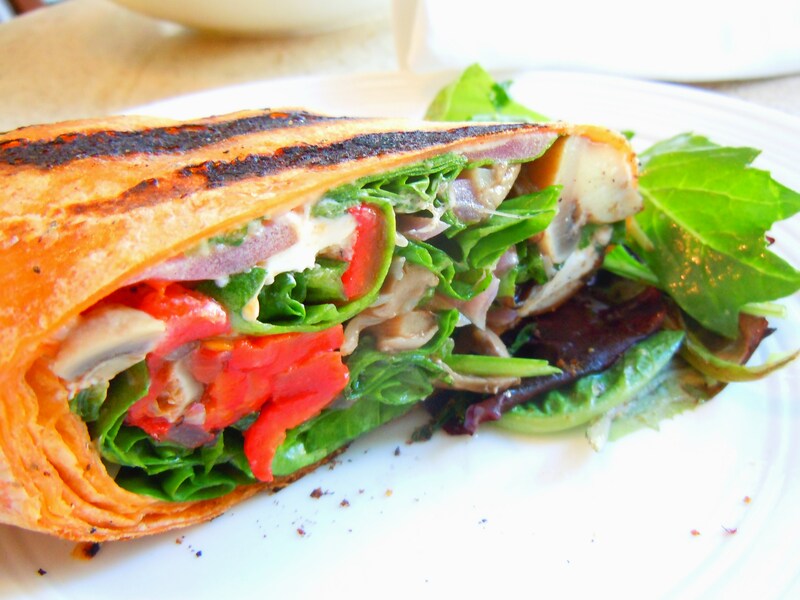 For those who loooove grilled wraps and vegetarian sandwiches, you need this in your life. The goat cheese and eggplant totally do it for me and it’s just gorgeous to look at. It is a thing of beauty and so soft and flavourful with a hint of smokiness from the grilled vegetables and grilled tortilla wrap. Finally, the salads. 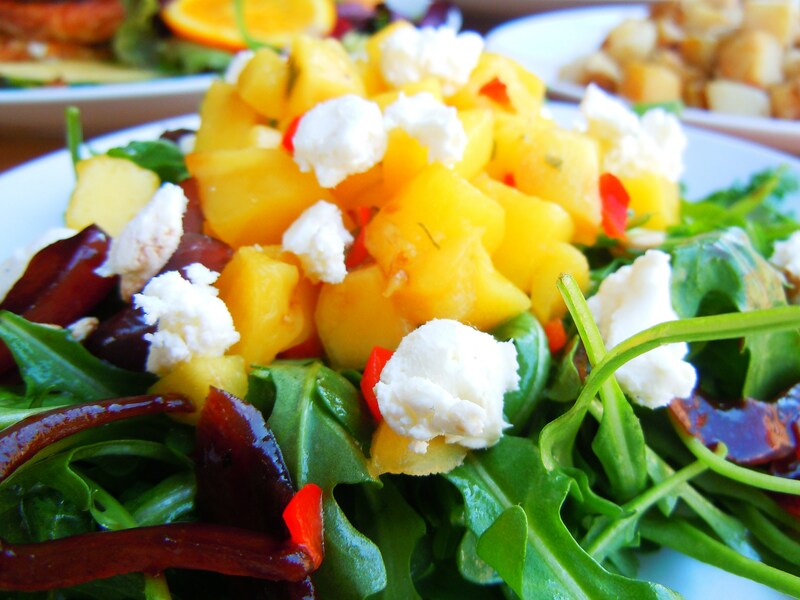 The scrumptious, mouthwatering salads. 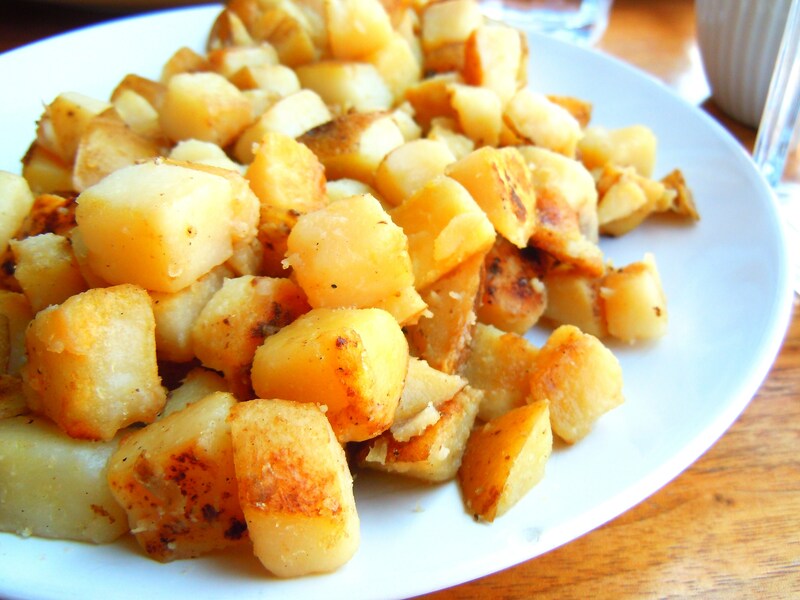 They are perfect as an accompaniment to the sandwiches but also just as perfect on their own. 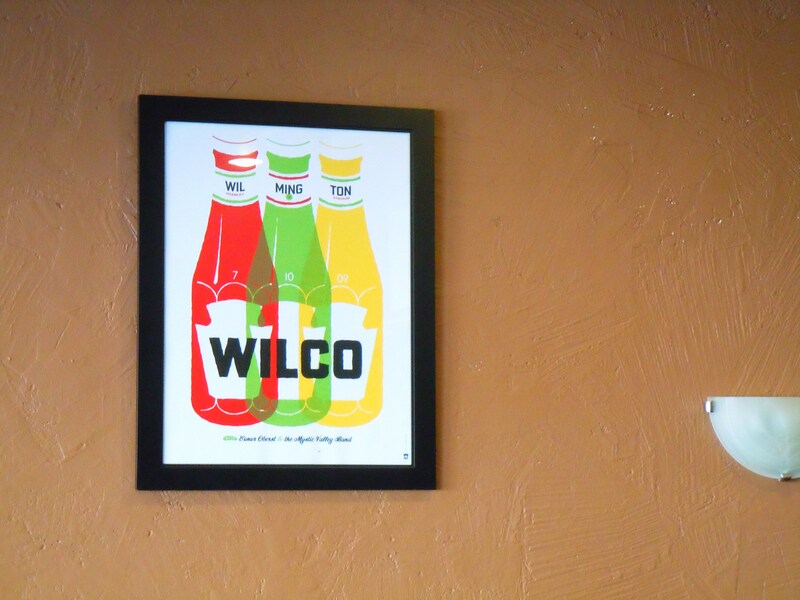 They are truly top-notch and for $4.50…you really can’t ask for more. 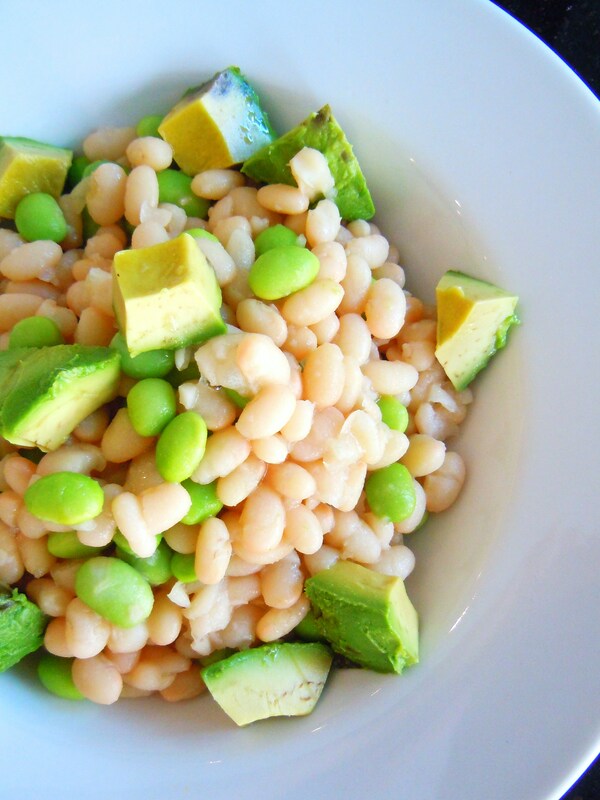 I watched as Chef John cooked the soaked white beans, infusing them with warm rosemary flavour in a giant pot of boiling water with onions and brightening them at the same time with crunchy edamame and soft, creamy avocado in the finished product. It’s a beautiful fusion of warmth and comfort with lightness and it’s definitely a winning combination you don’t find at other places. 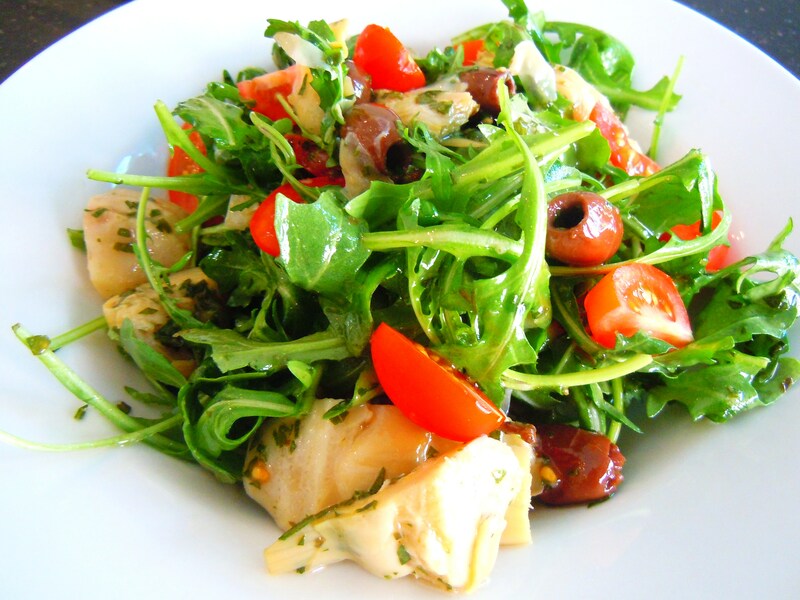 To finish off: the arugula and artichoke salad. 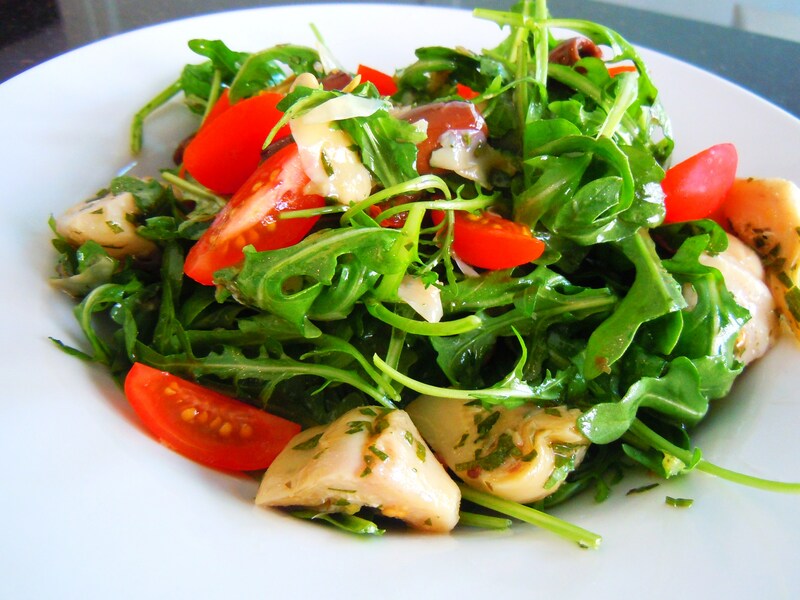 I love arugula so much and the red wine vinaigrette that the salad was tossed in was delicious. 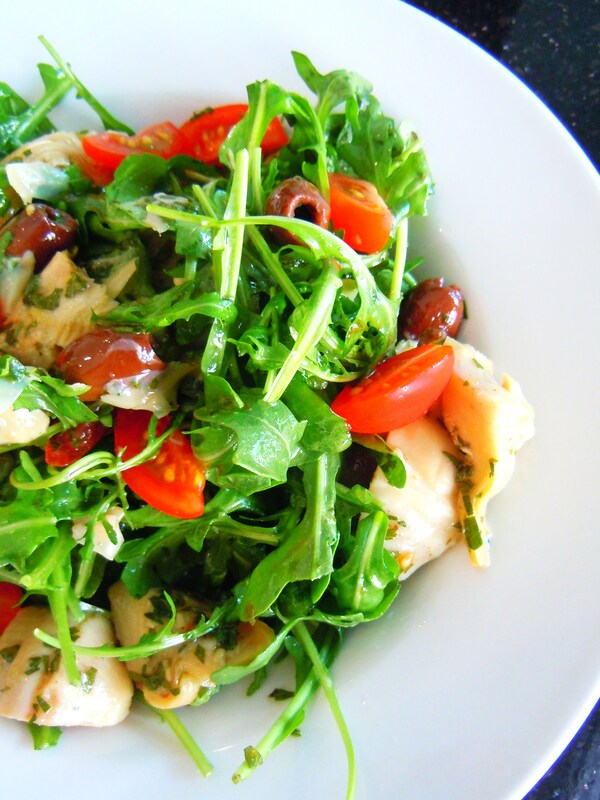 The tomatoes in the salad balance out the briny flavour of the olives and artichokes and peppery bite of the arugula, and parm just elevates the savouriness to another level. 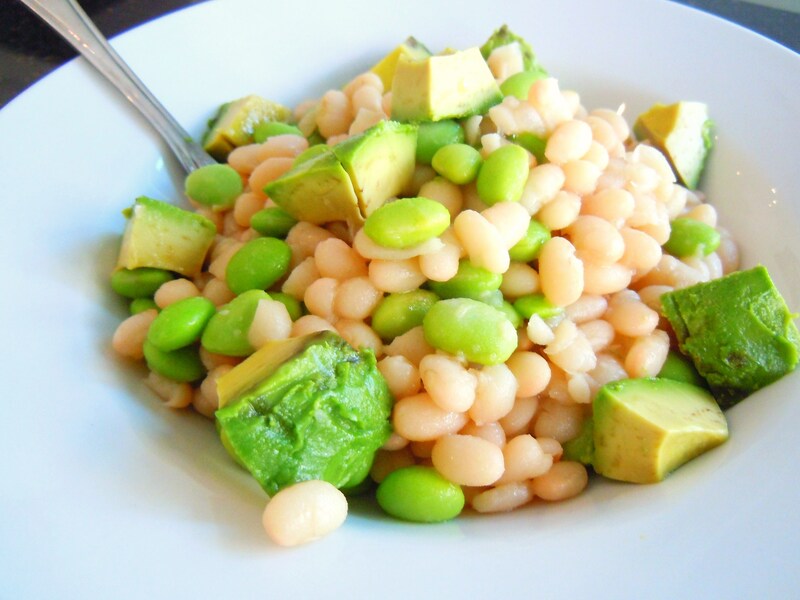 These are the types of salads I always wish for because their hearty with substance but still light and fresh in flavour. The menu and the people here make the espresso bar such an inviting place for coffee, tea and lunch and I feel so lucky to have been able to enjoy the food and learn about it at the same time, watching Chef John make the food from start to finish and getting to know the people and the cafe from the inside out. Rita and Tony made me feel just like family. It’s almost the first anniversary of my first visit (October 21!) and I think it’s high time I went back again to try even more of their delicious menu. 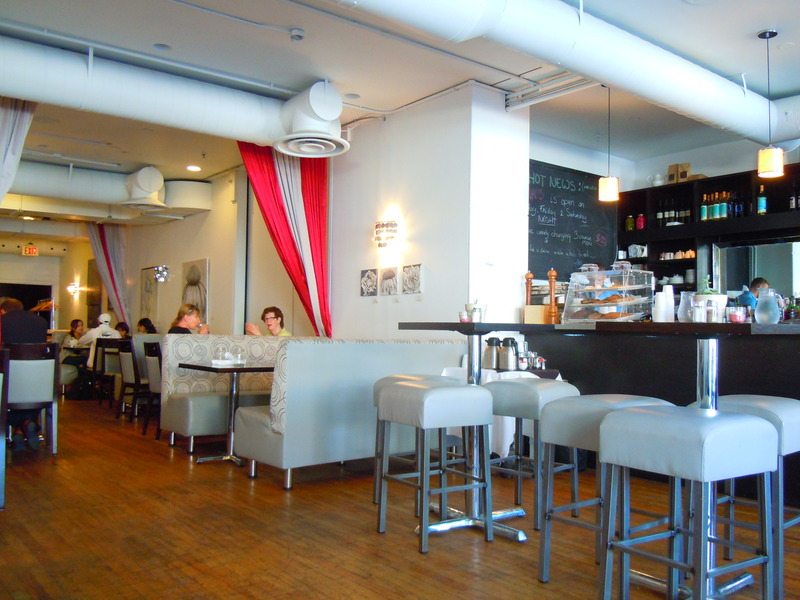 Yorkville Espresso Bar is located at 3 Yorkville Ave., just west of Yonge Street and north of Cumberland St. 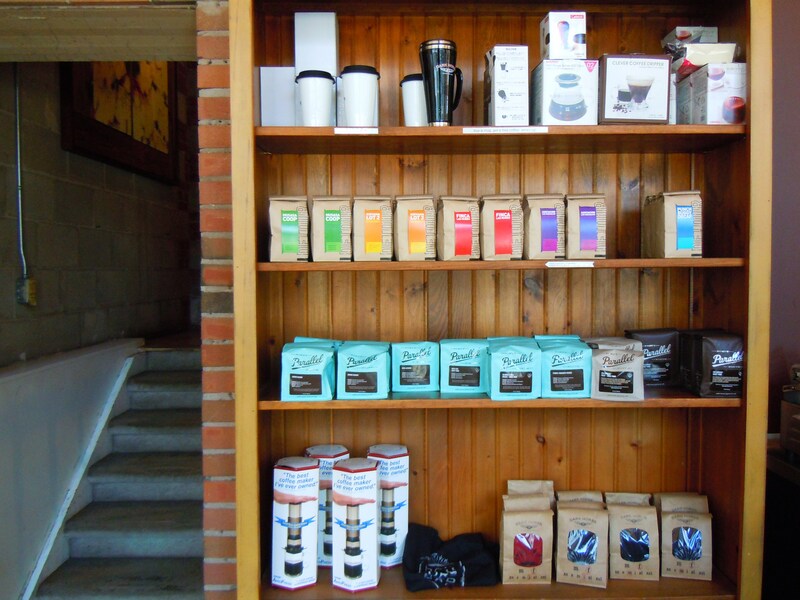 They are open 7 days a week from 7:30am-7pm Monday to Friday, 8am-6pm Saturday, and 9am-5pm Sunday. 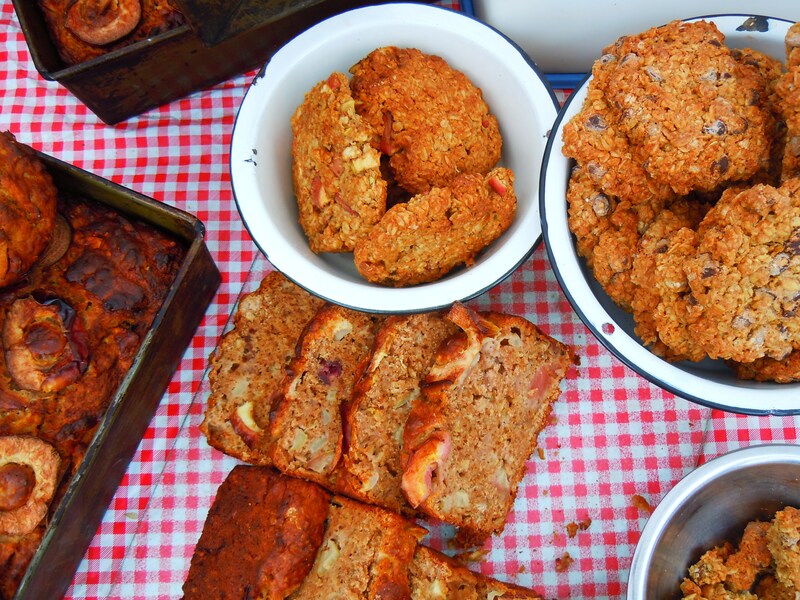 Another summer, another market – it’s the return to Sorauren farmers’ market! The Sorauren market, run by the Westend Food Co-op, is one of the few markets in the city that operate year-round on a weekly basis (as opposed to biweekly or once a month during the winter months) and while I’ve made a number of visits to Dufferin Grove and Wychwood Barns throughout the fall and winter, Sorauren has been completely off my map since last summer and I’ve felt awful about it. I try my best to hit different markets to give everyone a well-rounded representation of what’s offered in the city, but sometimes I just don’t get around to certain parts of town on specific days of the week (I spent many of my Mondays during the fall and winter cupcaking it up as an icing sugar queen at Le Dolci!) and sometimes I’ll go to certain markets more often to compensate or fill a previous or existing void. I am SO happy I made it out to the Monday market (3pm-7pm) at Sorauren again this month because I truly felt like I was visiting them for the first time! It felt livelier, more bustling. And this was the atmosphere at the market when the threat of thunderstorms were imminent! Just think how much more flouncy the crowds would be on a sunny day. The number vendors honestly looked like it had multipled since last year and I had so much fun going from table to table, looking at all the beautiful fruits and vegetables and baked goods, and drooling over old favourites like my fresh and vibrant veggie pizza buns from Alli’s Baked Goods, vegan chocolate yummies from Chocosol, and of course, my beloved raw and vegan eats from Earth & City. Two vendors in particular made me totally fall in love with Sorauren all over again: The Co-op Kitchen and Yule Britannia. I bought food and goodies from both of them and I LOVED what I ate and only wish they could be at every market in the city! Here’s a little background though: The Westend Food Co-op is a co-opertive (much like Chocosol) and community organization that strives to build awareness of food security and accessibility issues in and around the city, to engage the community in food initiatives, to create meaningful relationships between producers and consumers while at the same time recognizing and acknowledging that these relationships are not necessarily dichtomous ones but ones that often overlap and intersect, and to bring good food to west end Toronto communties. The Co-op Kitchen in particular is affiliated with the Westend Food Co-op’s Food Hub, an arm of the co-op that is specifically dedicated to providing community kitchen space, workshops, educational opportunities, and fresh food among many other things. They now come to Sorauren market with a menu of delicious dishes and items, straight from the kitchen, and this was the first time I had seen The Co-op Kitchen’s booth and table and I was ecstatic! 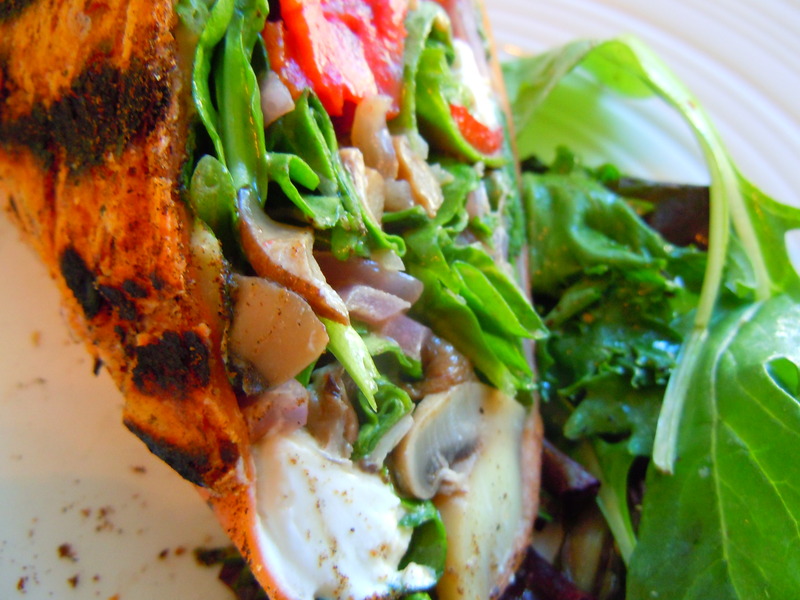 Veggie sandwiches! Smashed potato salad! Hummus and crostini! 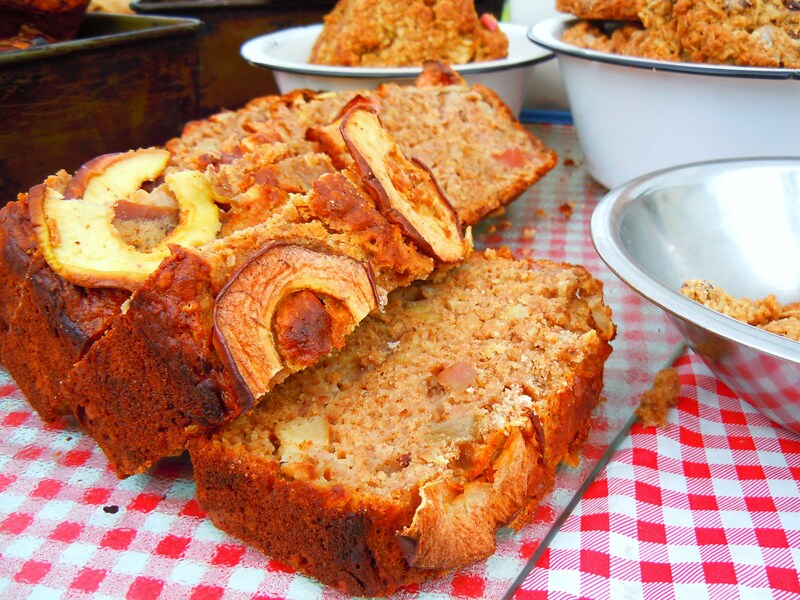 Spiced apple cake and oatmeal cookies! Prices are ridiculously reasonable ($2-$5!) and you could seriously eat yourself silly here. 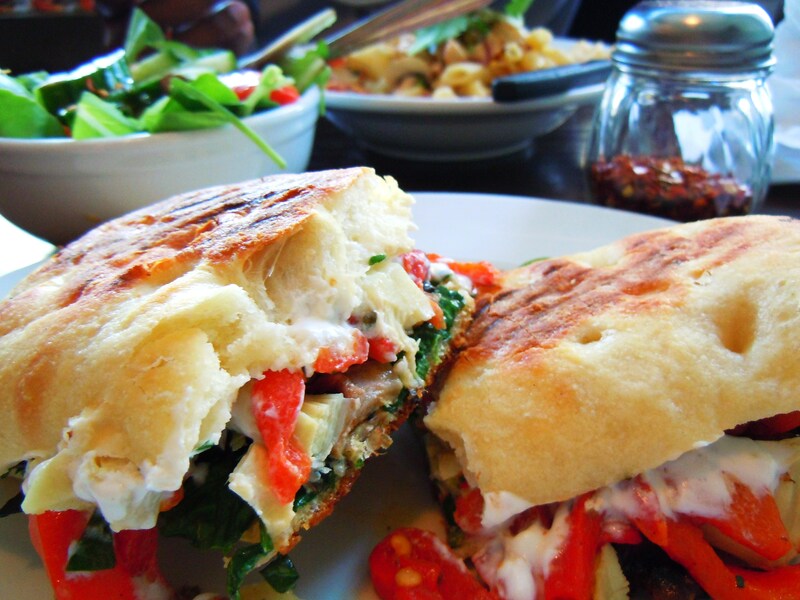 On this particular day, they had this HUUUUGE platter of fresh baked spelt focaccia sandwiches stuffed with roasted tofu, peppers, and onions, asparagus, greens, red root relish, and pesto. They looked like party subs! A whole sandwich costs $5, half for $3 and I happily nabbed myself a sandwich and hungrily dove into it when I came home later that night. 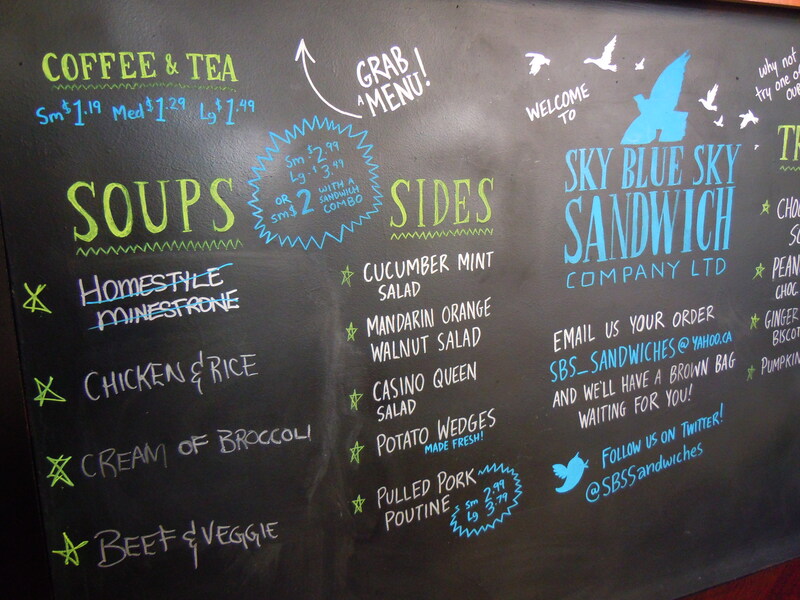 Their potato salad and spiced apple cake looked amazing (I wistfully looked at another customer inhaling his bowl of potato salad) and after enjoying such a delicious sandwich, I desparately wanted to try more food. Another time! 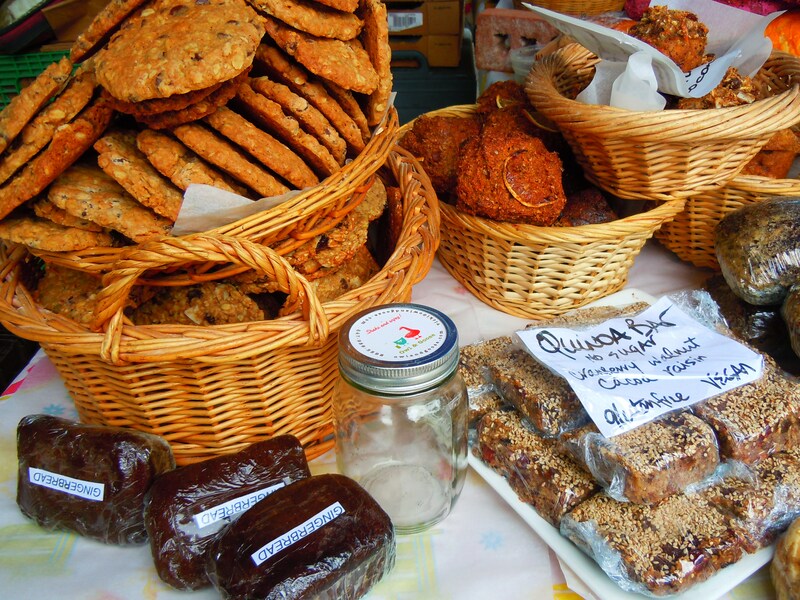 Yule Britannia/Britannia Bakes is another must-visit and eat at the Sorauren market. 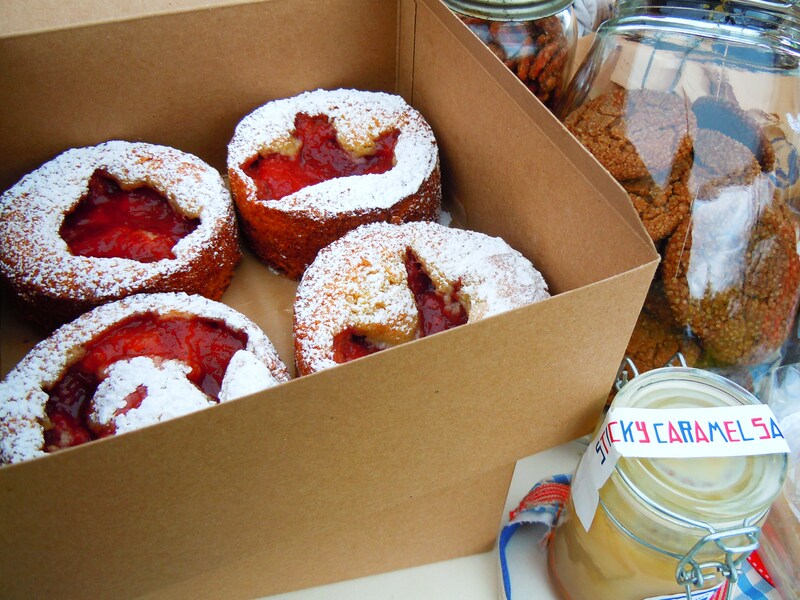 Think British, Scottish, and Irish baking right here in Toronto! 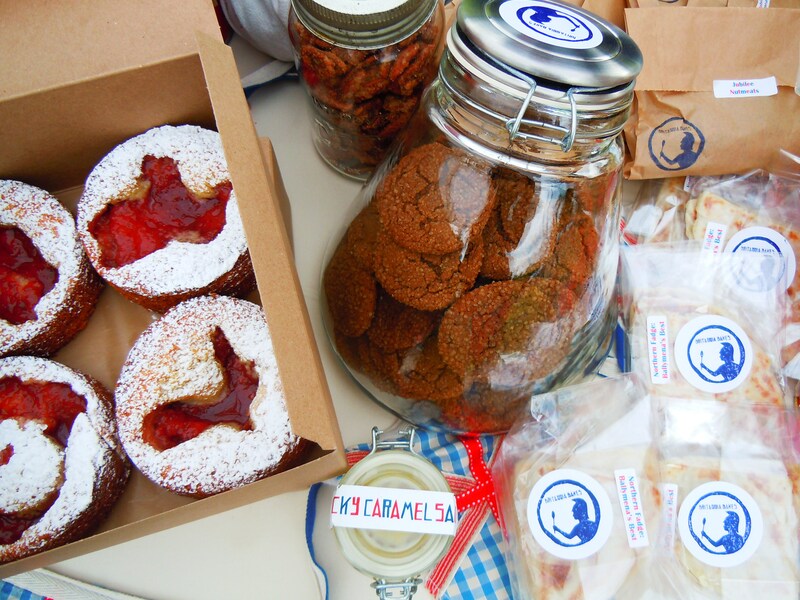 Elizabeth Mitchell, head honcho of Britannia Bakes, is so super nice and she happily explains what all the goodies are and their origins as you munch on delicious samples. Her table is lovely and I had so much fun snapping photos of the beautiful set-up. There were giant, fresh fruit tarts, savoury crackers, Irish fadge(yes, that’s right, fadge, not fudge!) potato pancakes, sticky caramel sauce, and my pick of the day, some of the BEST GINGER COOKIES EVER! You can either buy them as singles (75 cents each), 3 for $2, or half dozen for $4. 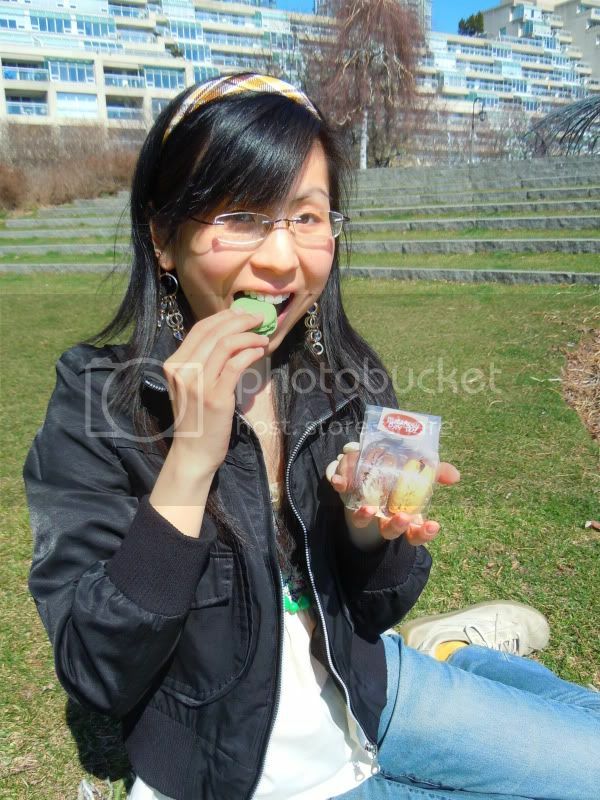 I grabbed 3 for $2 and as soon as I ate one, I instantly regretted not buying the entire glass cookie jar! They are SO soft and bursting with the freshest sweet ginger flavour. 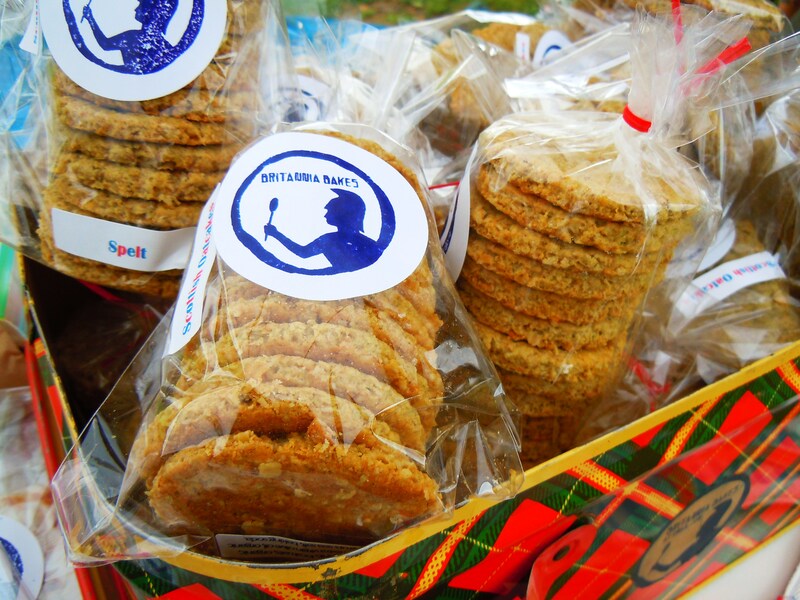 These cookies, along with the giant ginger molasses cookies from More Than Pies Baking Co. Ltd at the David Pecaut Square farmers’ market are the best I’ve ever had. It was a joy to finally come back for a return visit. I actually came early and plunked myself down on a bench to read while all the food vendors and farmers set up their tables and it so nice seeing everything and everyone come together for an afternoon of local food. 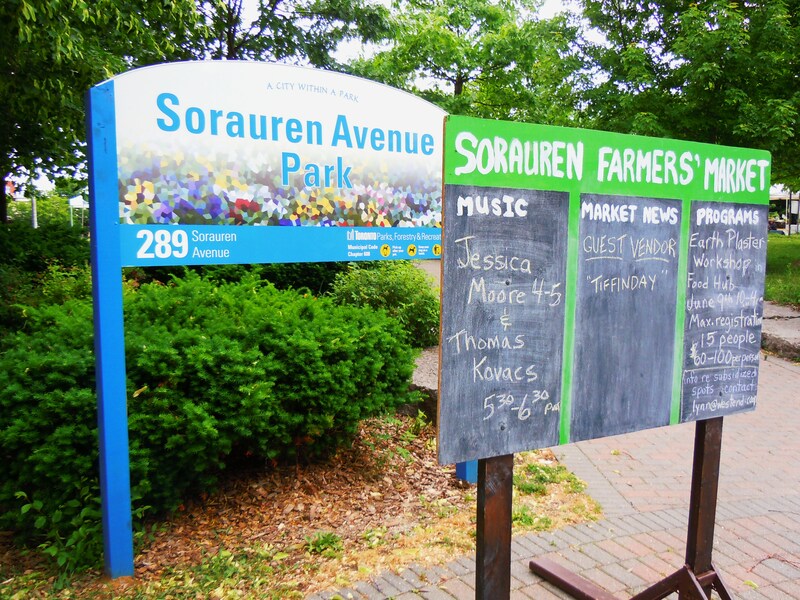 The Sorauren farmers’ market is held on Mondays from 3pm-7pm in Sorauren Park at the corner of Sorauren and Wabash Ave, south of Dundas Street West. The market is held year-round, operating indoors in the fieldhouse during the winter and outdoors at the park during the spring, summer, and early fall. The easiest way to get here is by taking the 505 Dundas streetcar westbound. 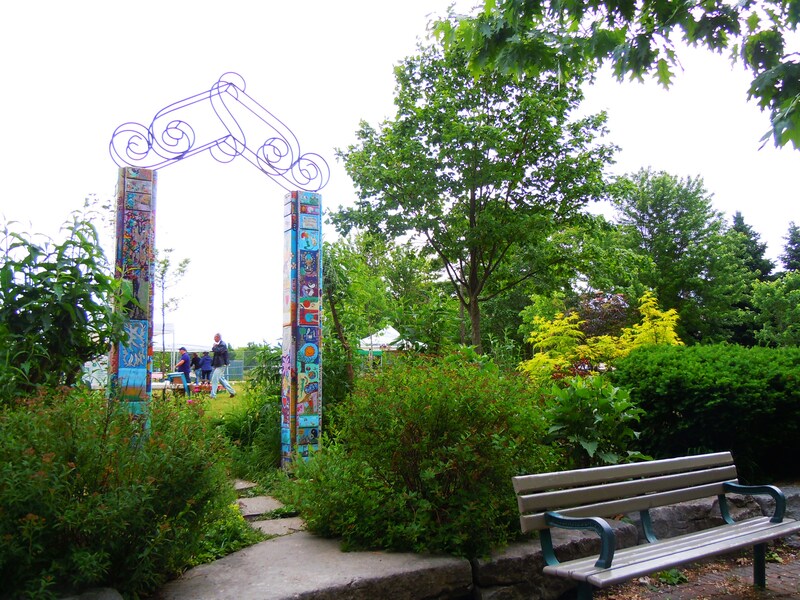 If you’re envisioning major roads and intersections, Sorauren sits between Roncesvalles Ave. and Lansdowne Ave. For more info about the market and other events in the area pertaining to organic, local food, and the West End Food Co-op organization, click here. Sandwiches? Vegan sandwiches? At a coffee shop?! Yes siree. 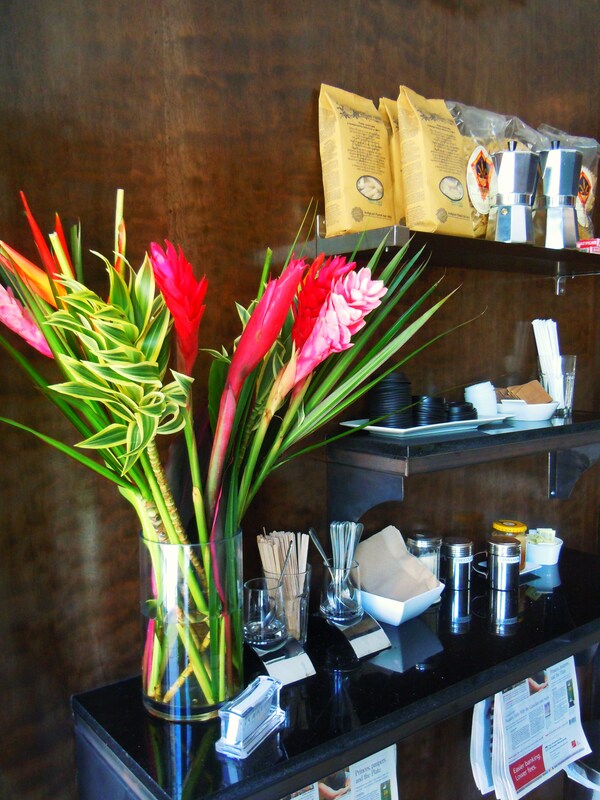 Bring a book, a magazine, or a friend to the popular java haunt and sit back and relax with some sips and eats. 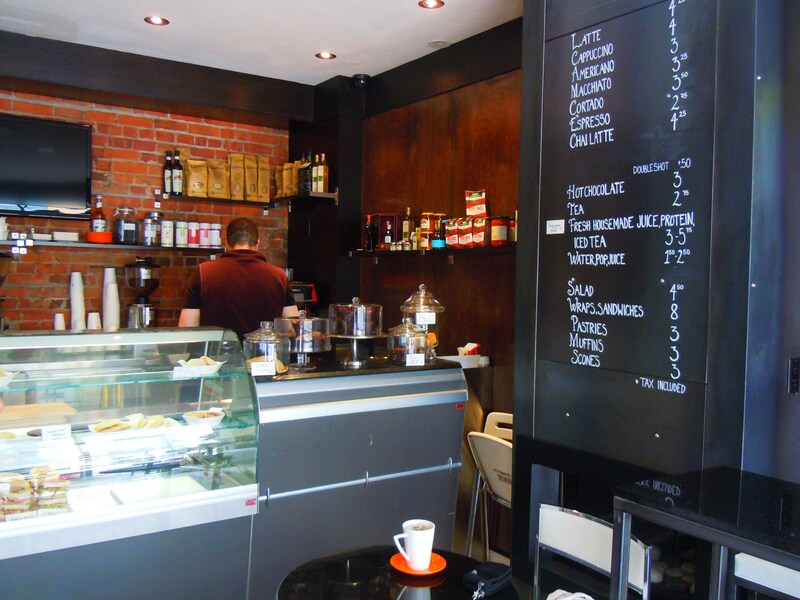 Dark Horse Espresso Bar, with 3 locations around downtown Toronto, is your one stop coffee shop for sunny laptop and tablet fun, coffee, lattes, summer and winter drinks, sweet treat baked goods, and grilled panini sandwiches. I’ve sat back with an apple cider and a latte on two separate occasions and with its pretty orchid flowers and beautiful artwork on the walls, it’s a really nice coffee shop to be in. It’s one of those perfect “oh my goodness, I need to get some work done but staying at home by myself makes me want to stab myself with a pen” spots because it’s airy and open with big communal tables, so it provides the space to be anonymous without being completely alone AND you get to enjoy food and drink while doing it! Recently, I’ve been hemming and hawwing about getting some work done at my local library but I’ve been hesitant about going just because the area lacks food options (I’m not kidding, the closest food option is a dot on the 3 km radius map) and we all know we can’t start breaking out the 3-course meals from our kitchen tupperware containers in the middle of the library. 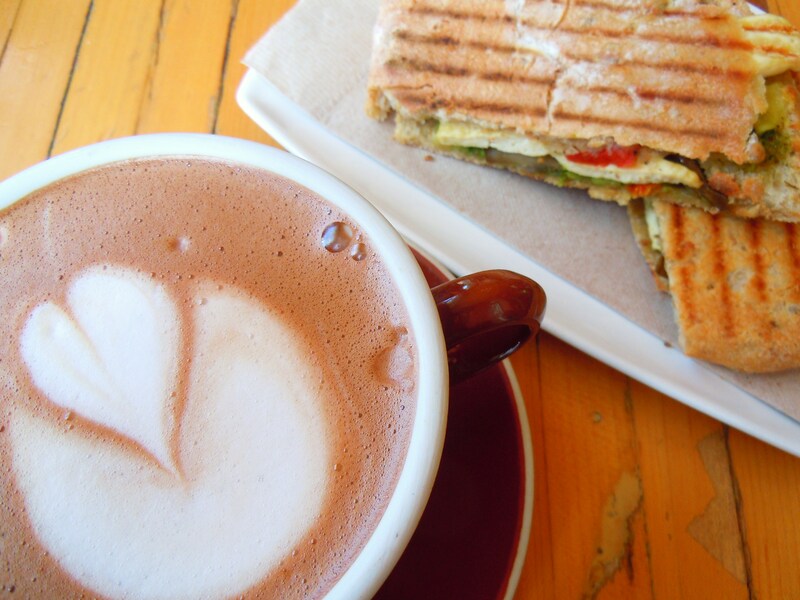 So, Dark Horse poses itself as the more appealing option for a day of web work and after I had my lovely vegan grilled panini sandwich and hot chocolate, it posits itself as very delicious one too! I love how I can go to Dark Horse and ask for cute latte art. I know, you can get latte art at several other coffee shops in the city but I haven’t been to those yet, so humour me! 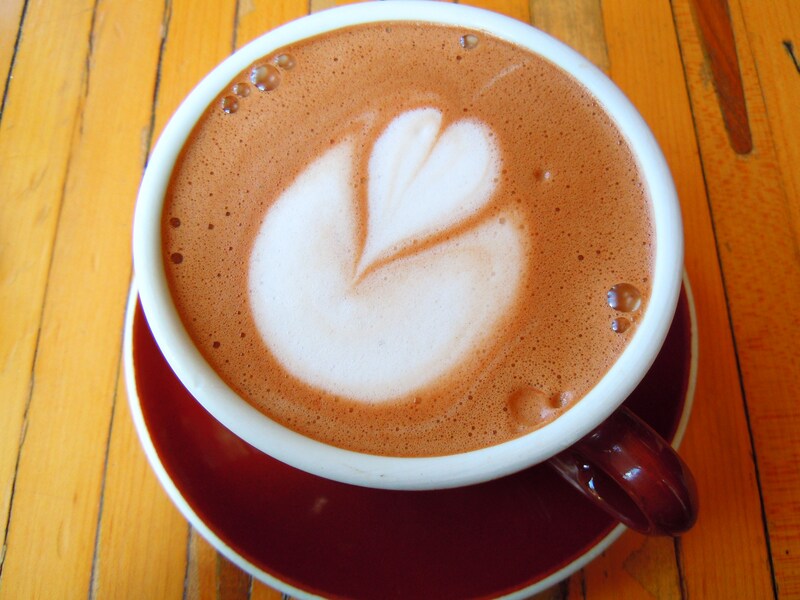 I asked for a cute heart in my hot chocolate ($3.09) and I got the most adorable heart/tulip heart shaped flower! It was unintentionally (or maybe it was intentional on the part of the nice barista…) perfect for spring and if you like foamy hot chocolates, Dark Horse is your spot. Don’t do what I did though and leave it sitting for too long. I was so busy snapping photos of it and my sandwich that the foamies stuck to the inside of the mug and while it was kind of funny having to scrape some of the hot chocolate off, it’s not something I would suggest to anyone else. 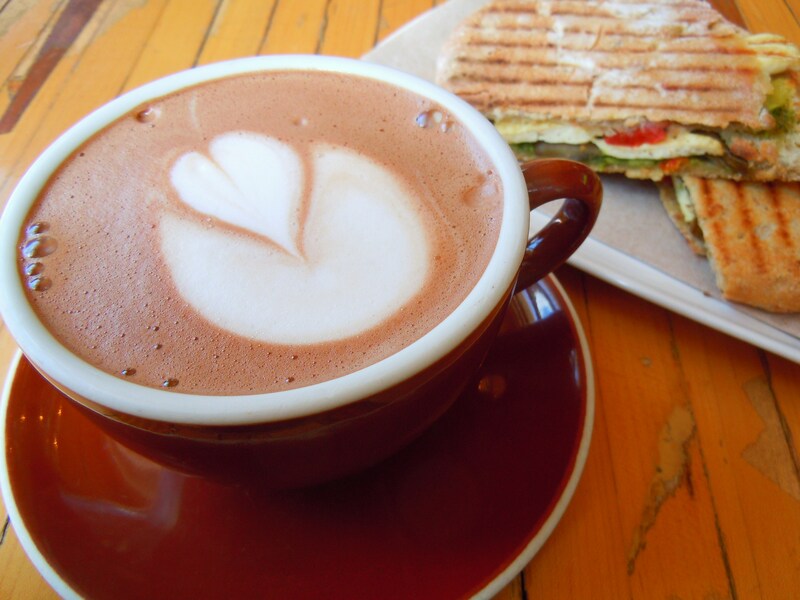 Their hot chocolate is very mild and foamy in taste and texture. It’s not a fudgy type of chocolate taste, nor is is straight up cocoa powder in taste either. It’s airy and light and if I had to compare it to something, I’d say that it tastes more like an unsweetened mousse that’s been air whipped into a hot chocolate drink. For those who don’t like it sickly sweet and just want something that tastes more natural and light as opposed to rich and decadent, this is what you want. I’ve had my eye on their vegan sandwich for months and months and it has taken me so long to finally get to it, but it was worth the wait because I really enjoyed it! While I would have loved a big, stacked vegan sandwich baguette style or just a thicker sandwich in general, the vegan sandwich delivers in flavour on all counts and it’s hard to be hard on a panini sandwich based on its thickness; a panini is, essentially, a flattened grilled, toasted sandwich. 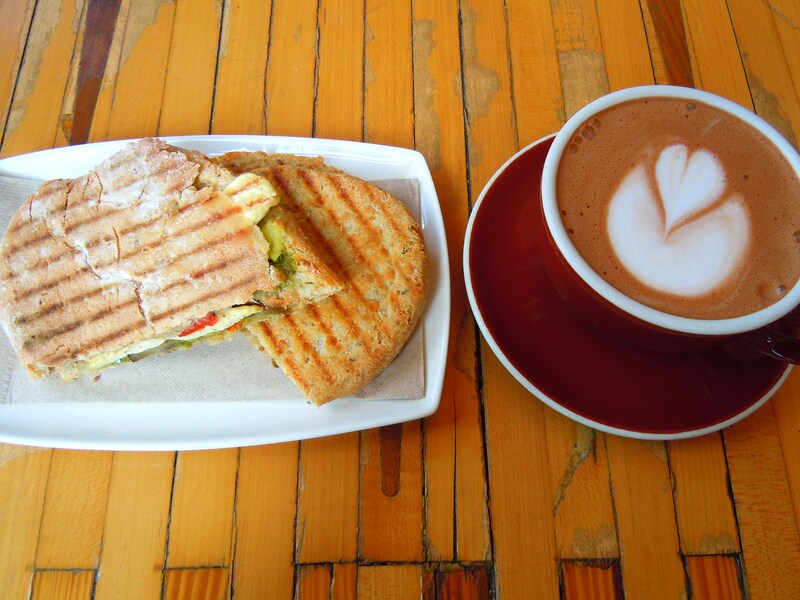 Dark Horse serves up a number of grilled panini sandwiches during the day (come after 11am and they’ll all be ready), with both meat and vegetarian options ranging from $6-$7. These include grilled cheese, hot salami, turkey, and avocado and asparagus in addition to the vegan sandwich. 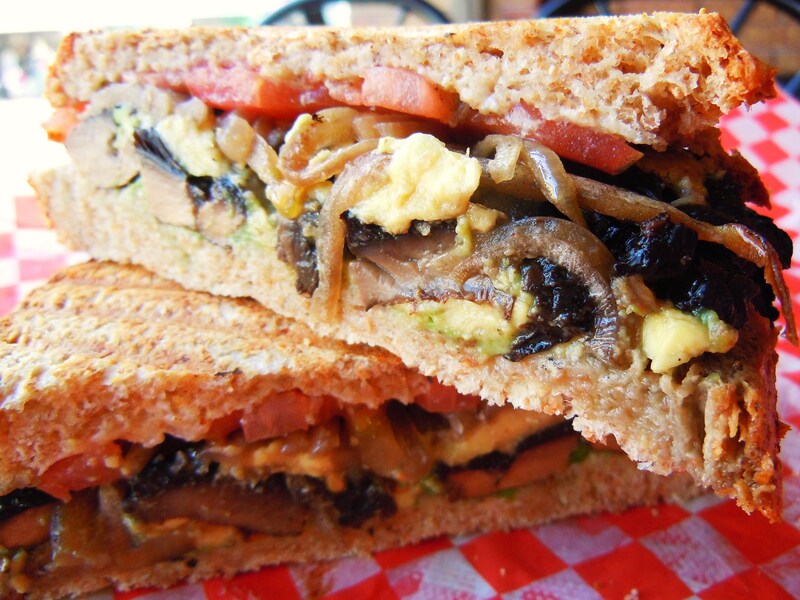 The vegan sandwich is filled with a mix of firm tofu, grilled eggplant, roasted red peppers, avocado, and a coriander pesto spread. I was totally expecting a run-of-the-mill grilled vegetable sandwich but what I got was an out-of-this-world warm, savoury, slightly spicy, ginger taste that emanated throughout the entire sandwich. It took me completely by surprise and I found myself enjoying the sandwich more and more with every bite. The bread was fantastic in texture with crunchy, grainy bits that had tiny pockets of savoury saltiness to it and the tofu wedges were perfect because they were firm without being rubbery and it fed off of the coriander pesto and grilled vegetables, absorbing their flavours while still retaining its own, well, tofu-ness. The bread and the spread totally did it for me and I had flavours in this sandwich that I had never come across before in other sandwiches and for that, it makes it unique. 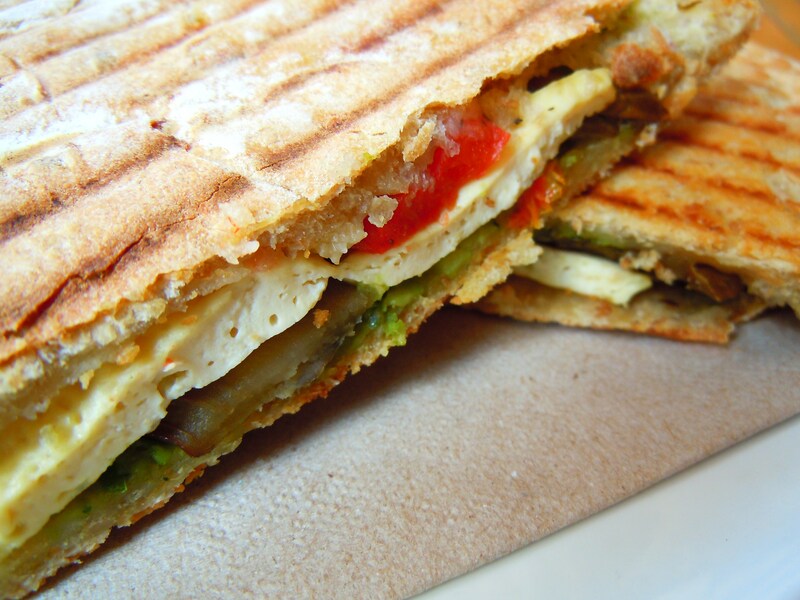 Do I wish panini sandwiches in general were bigger and less flattened? Sure. But I’m more happy with the fact that it tasted great and that it was something I could see myself having again. After all the dishes and things I’ve had in my life, especially since I started Ate by Ate, I’ve come across things that have been not-so-great and at the very least, forgettable, but this was a sandwich that I truly savoured and liked. Things have been quiet on the Vegetarian Sandwich series front, so I thought it was definitely time to unleash some veggie goodness back into things! I have my fellow Icing Sugar Queen at Le Dolci, Miya, to thank for the inspiration behind this post. Not only have I learned so much about cupcake decorating and design during my time at Le Dolci so far, but Miya and Lisa have also introduced me to some fabulous good eats around the studio! It’s fun bouncing ideas and recommendations off of one another; I tell Lisa and Miya all about my farmers’ market adventures, they show me another island of vegetarian sandwich paradise. When I saw Miya eating her veggie sandwich during lunch one day at the studio, I got curious because it looked so yummy and I asked her where she got her sandwich from. 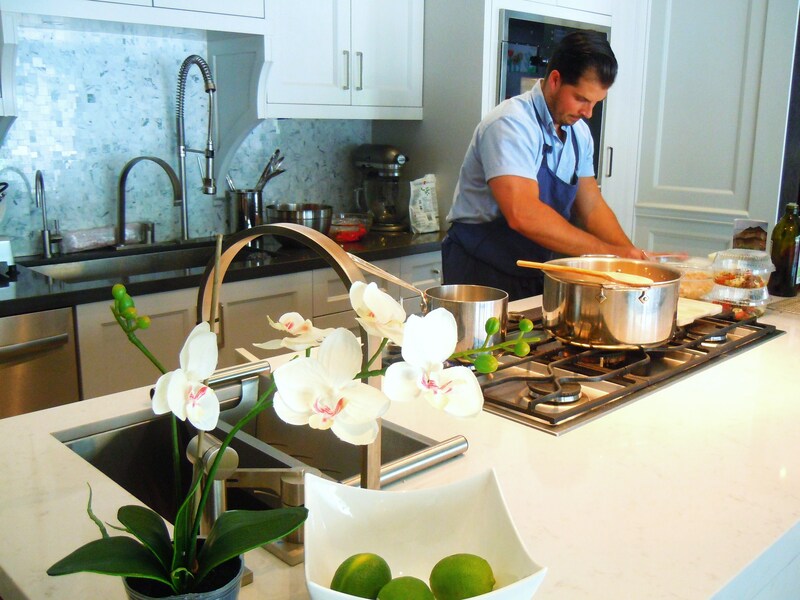 “Fusaro’s Kitchen”, she replied, between bites. I was quiet for about a nanosecond before the lightbulb went off and I almost literally face-palmed. Fusaro’s Kitchen! I knew where that was! I had passed by it numerous times on the streetcar and walked past it another handful of times. It was like deja vu all over again when I finally discovered Mela Cafe in Yorkville over a year ago after being in and around the neighbourhood so many times. I felt so lame. But I did what any dedicated foodie would do: I went and ate there. 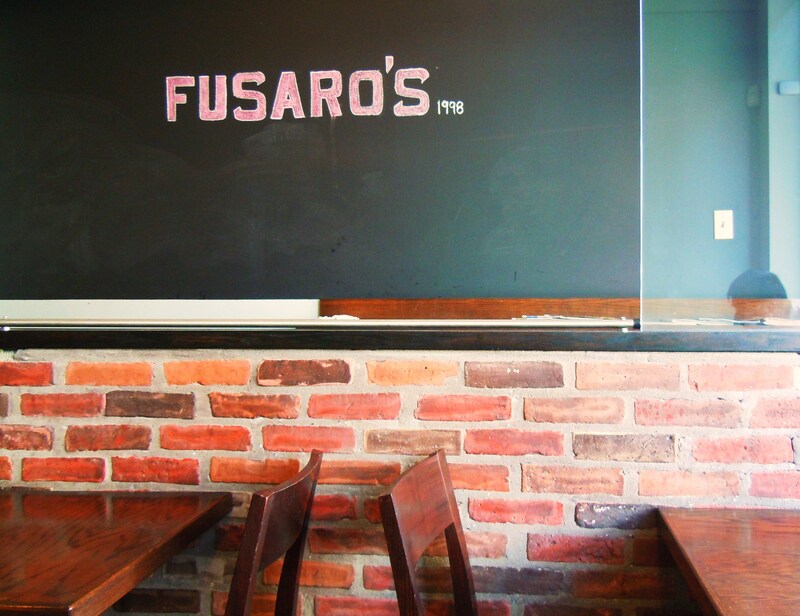 Fusaro’s Kitchen, located on Spadina Ave. just south of Queen Street West, is an Italian eatery with hot and fresh pizzas, pastas, salads, and panini sandwiches. I went in and instantly thought, “where have you been all my life? !” Or rather, where in the world have I been? 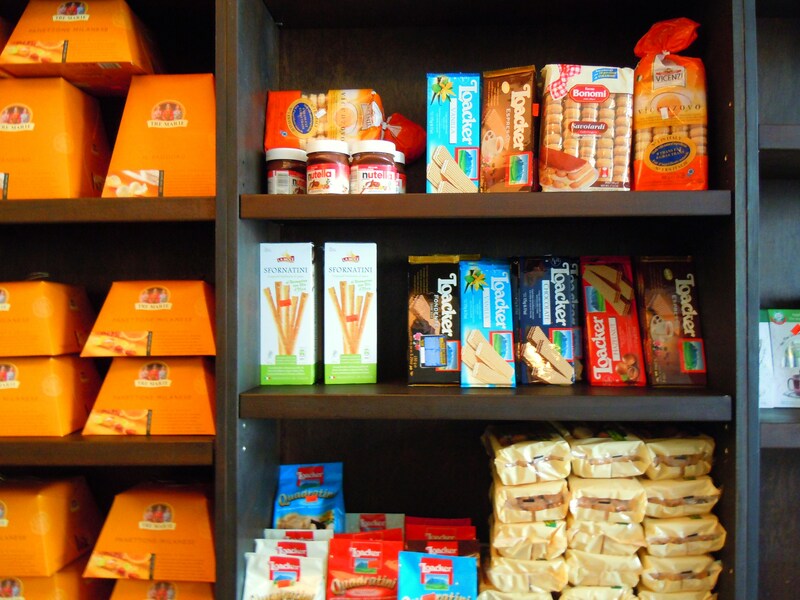 Fusaro’s has a giant wall full of Italian grocery items including chocolates, wafer cookies (Quadratinis, my favourites! 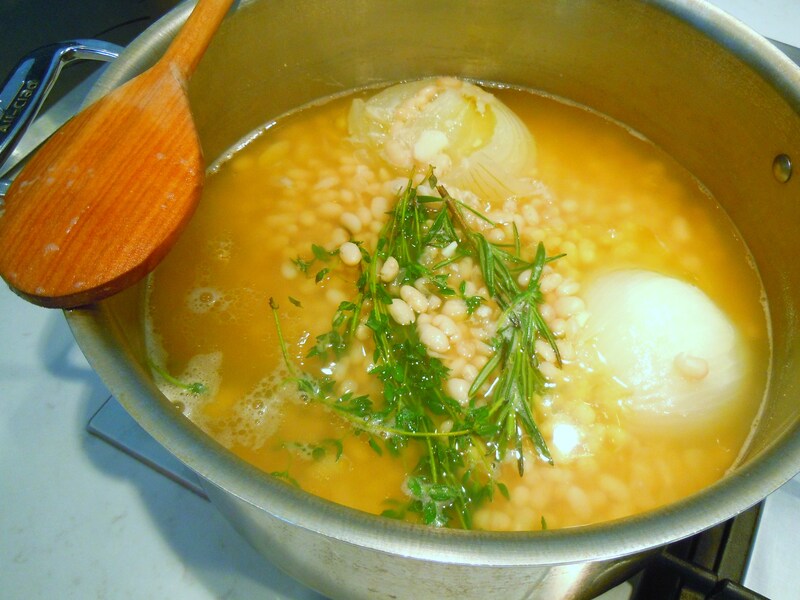 ), sauces, olive oils, balsamics, and more. I know I don’t blog about it enough, but god do I ever love pasta. Pasta is my weakness. I love it more than rice and bread. I suppose rice comes in at a close second when it comes to carbs and starches, but pasta makes me really happy. Spaghetti, lasagna, linguine, macaroni, fettucine, I love it all and I would be a happy clam if I was just given a bowl of spaghtti with nothing but olive oil and herbs. The pasta lover in me instinctively wanted to down a bowl for lunch, but I quickly remembered why I was there: to stuff my face with a delicious veggie panini. 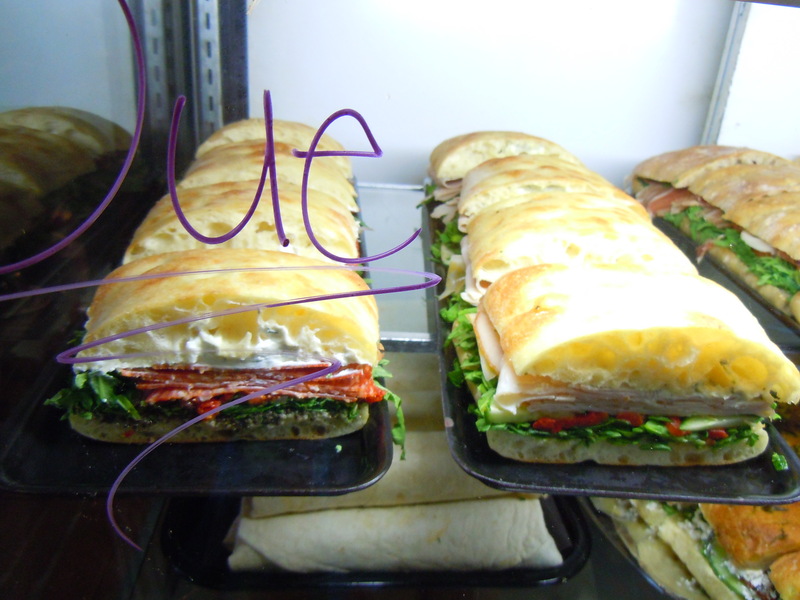 Fusaro’s has menus dedicated to grilled panini sandwiches, pasta, salads, and dishes such as eggplant, chicken, and veal parmigiana, meatballs, and others. Prices for pasta come in at around $10-$11, parmigiana and meatball mains at $8.50-$10.50, salads from $4.75-$10, and panini sandwiches from $7.50-$8. 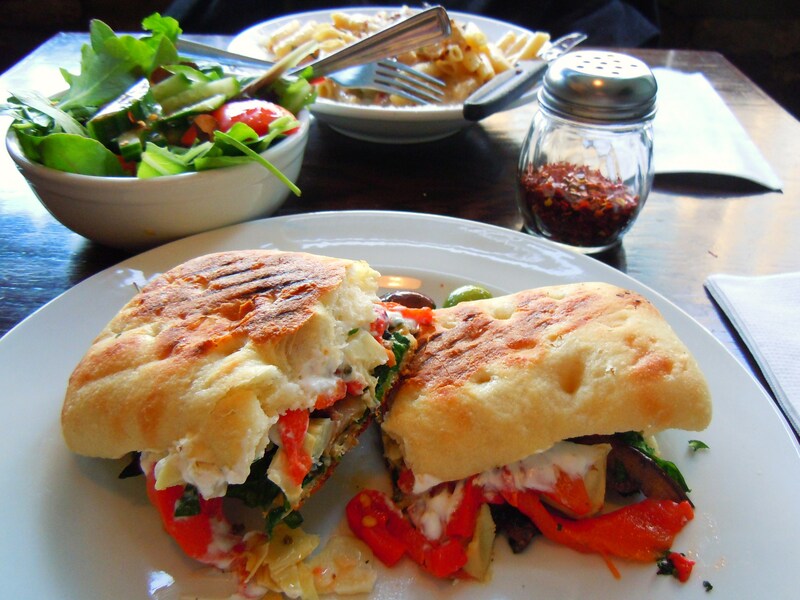 Fusaro’s has two vegetarian sandwich options and I chose menu item number five (cinque), a grilled panini with grilled zucchini and eggplant, roasted peppers, artichoke hearts, baby spinach, and goat cheese. I ordered a side salad ($2.50) to go along with it and waited in excited anticipation for my lunch. I was so excited like you wouldn’t believe. I know it’s “just” a sandwich, but I was excited about the veggie toppings (I rarely get to eat artichokes! 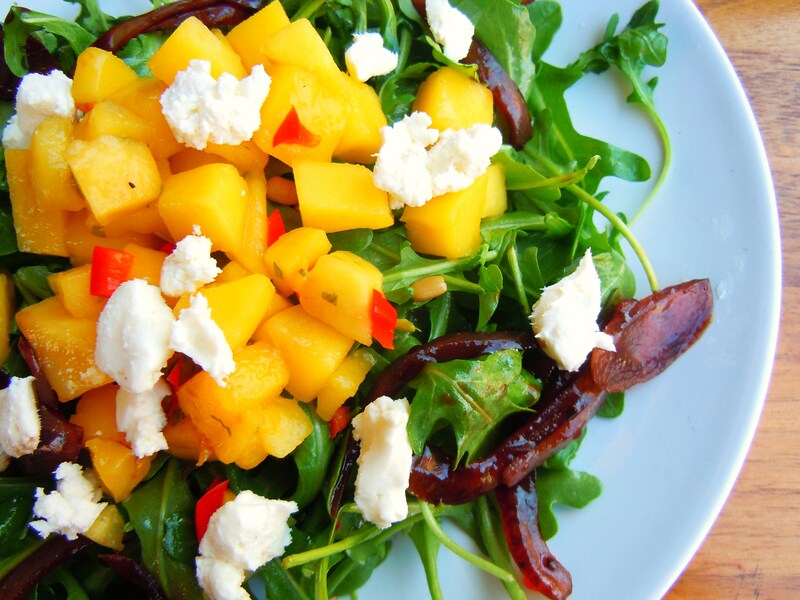 And you all know how I feel about things like roasted peppers, spinach, and goat cheese!) 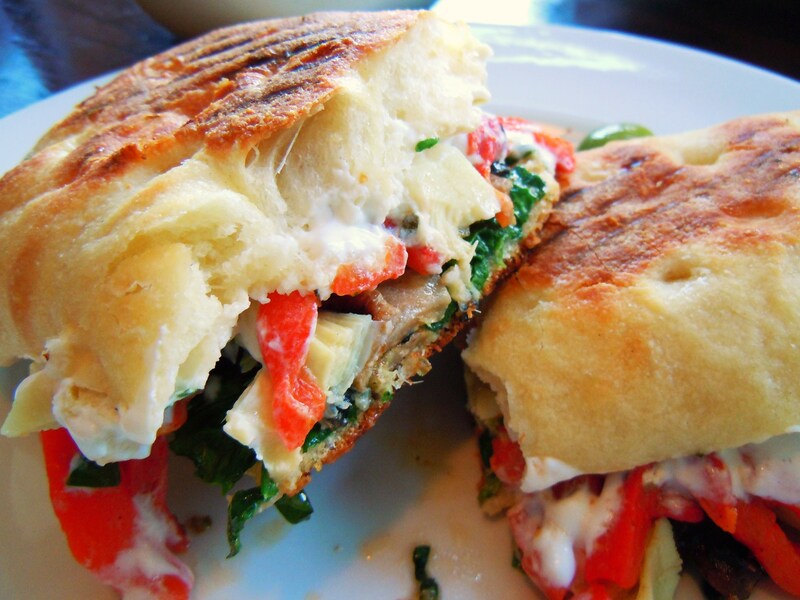 and I really believed this panini would be a knockout. Grilled paninis have been touch and go with me. They’re either a total hit or a dismal miss. 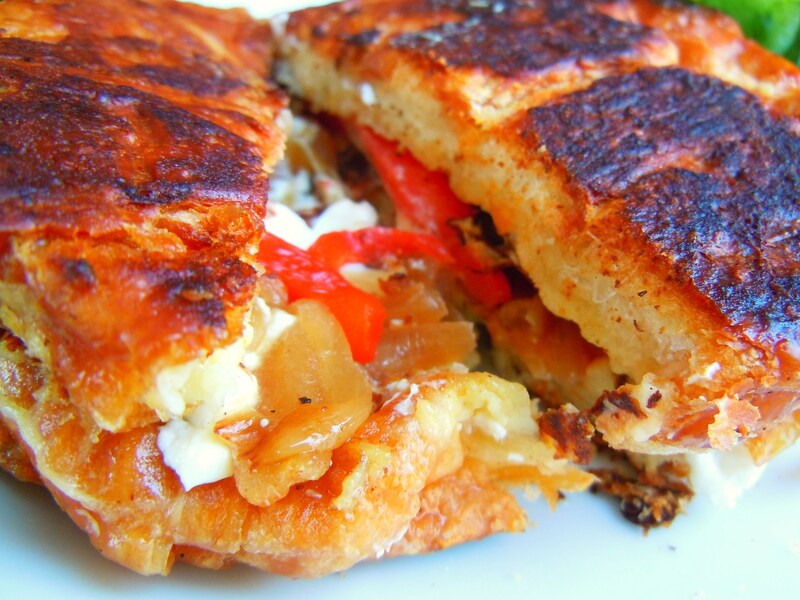 I love the idea of a grilled sandwich and when it’s executed well, it’s heaven. When they’re a miss though, often times it’s not necessarily because they don’t taste good or that the flavour isn’t there, it’s because they’re either too small, they don’t have enough substance between the bread, or the topping combinations are ho-hum and nothing to write home about. 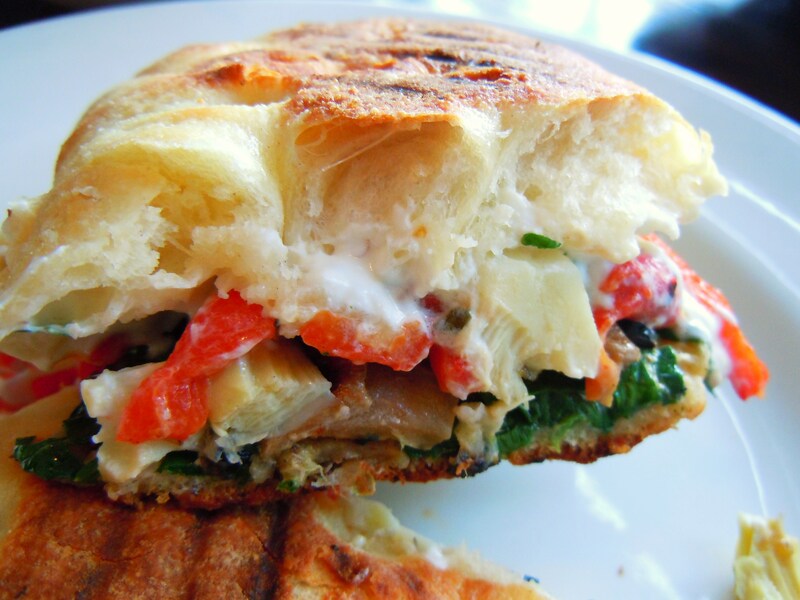 Sandwiches of this variety will always range from about $5-$11 depending on where you go, so a fabulous panini has to be bang for my buck and it has to have ingredients worth get excited about, especially when it’s a vegetarian sandwich. It just doesn’t make sense to eat something with nothing but lettuce and tomato and a few strands of something else. I loved this sandwich. 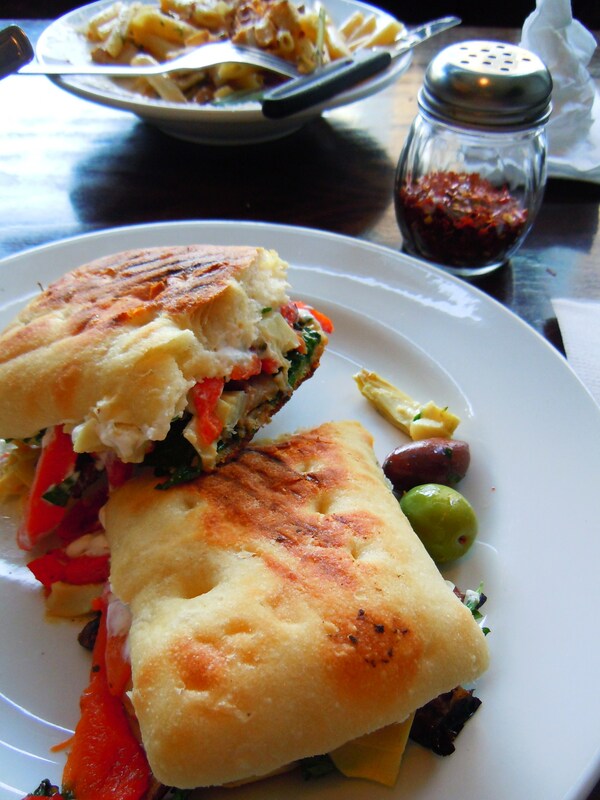 This sandwich makes me want to come to Fusaro’s every day of the week. Okay, maybe I’m exaggerating. But only a little. For one thing, it wasn’t small. This was a good-sized sandwich in both length and width, comparatible to a submarine bun from a bakery. It wasn’t the size of a foot-long, but definitely larger than 6 inches. I’d say it was closer to 8 inches. The bread was so crunchy on the outside and so super soft on the inside. 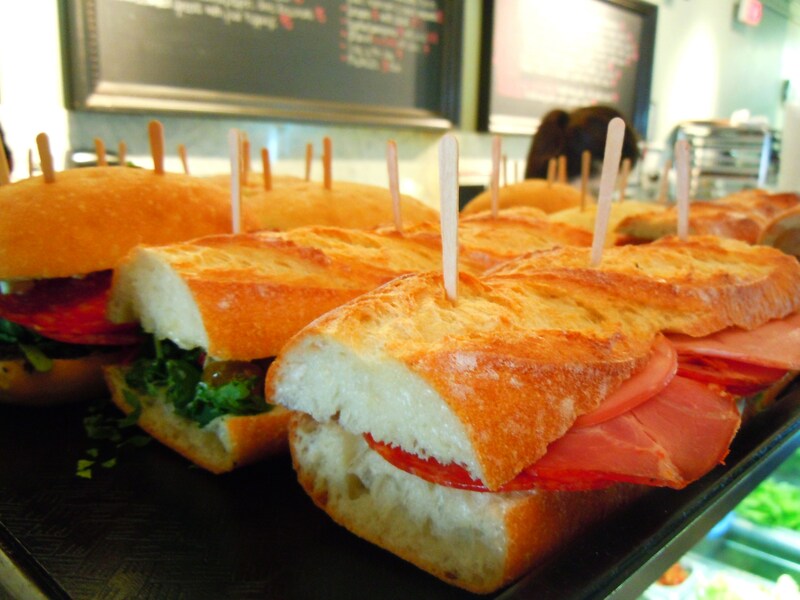 The hallmark of a good sandwich is whether or not you can envision yourself eating the bread alone. If the bread needs toppings to make it taste good, it means it isn’t. The bread should make your mouth water all by itself and this bread does. And the toppings. Oh my god. Vegetarians rejoice. 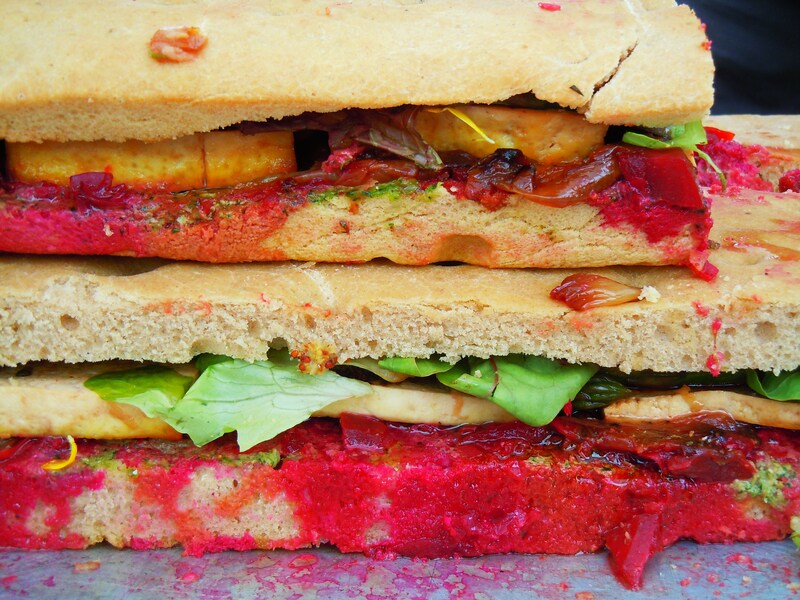 There was so much going on in this sandwich and it was all amazingly delicious. 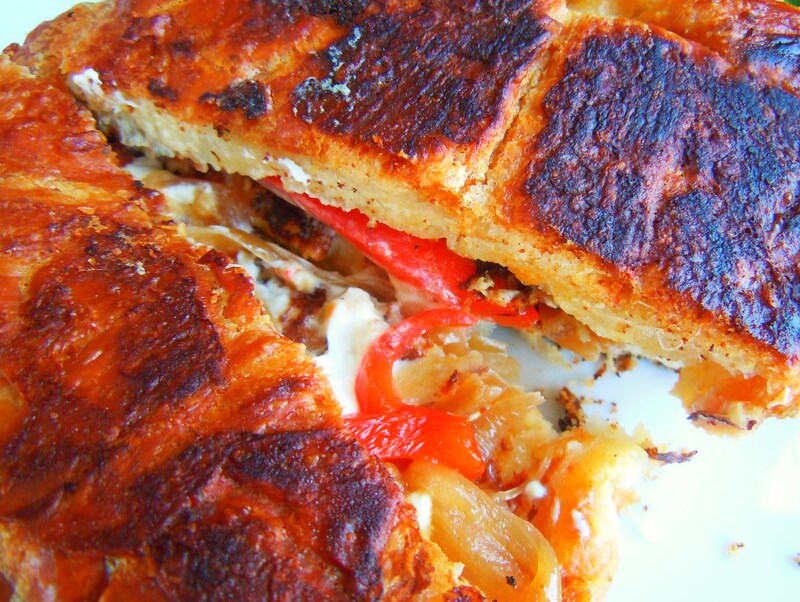 It was so stuffed with juicy vegetables and mouthwatering, creamy sauce. A bed of leafy spinach sat on the bottom with strips of roasted red pepper, chunks of artichoke, eggplant, and zucchini on top with goat cheese wedged throughout. The sauce was fantastic. It was a cross between a cream sauce and a mayo and it was delightful. I would eat this sandwich over and over again in a heartbeat. Oh, and the salad! 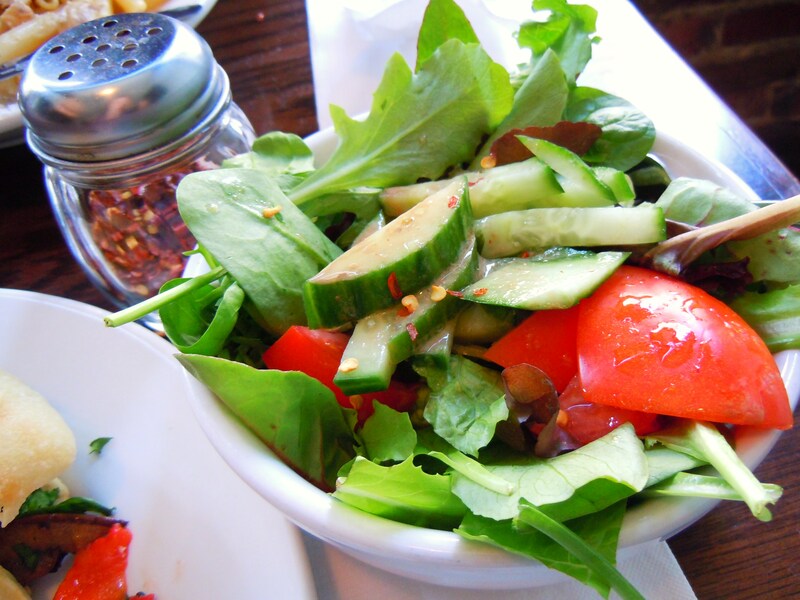 The salad was a simple salad of greens, tomatoes, and cucumber and it was made especially delicious with an olive oil and balsamic vinaigrette and I’m telling you, their balsamic is top-notch. I never used to like balsamic, but after an amazing meal at Southern Accent with a fabulous balsamic reduction and a great balsamic my mum bought, I’ve done a 180 and now I really enjoy it and can appreciate good balsamic. I was so happy with everything about this meal and I can’t wait to eat here again. Judging by the crazy line-ups here though, I’m going to have to luck out again next time. 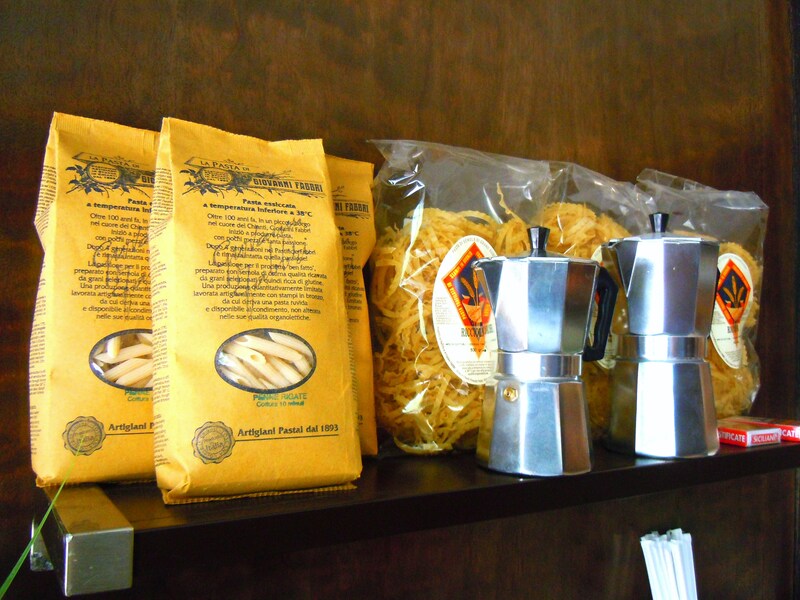 Fusaro’s Kitchen is located at 147 Spadina Ave., just south of Queen Street West on the east side of Spadina. 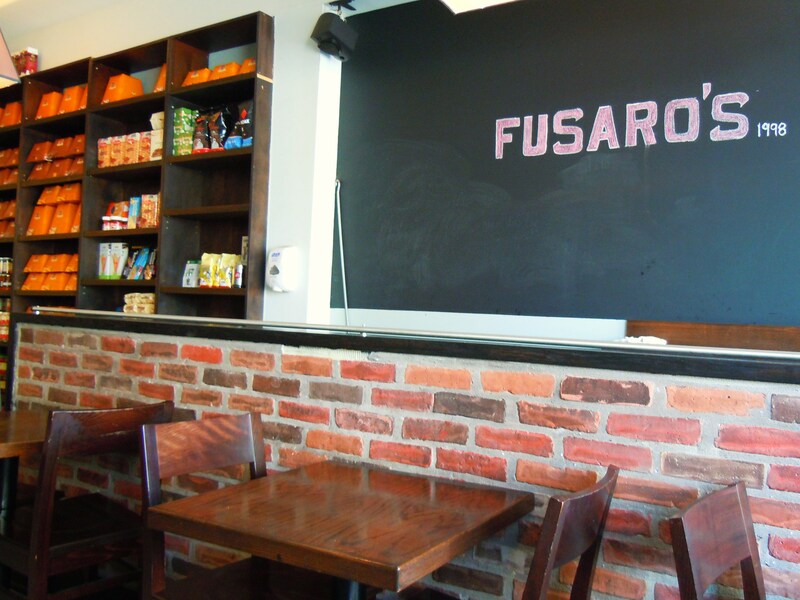 Fusaro’s Kitchen serves breakfast, lunch, and dinner and offers a breakfast menu 7 days a week. Here’s a secret, and maybe even a tip for those who want some inspiration: even though I make a lot of my foodie discoveries all on my own just by walking around, I have a little help finding out about a lot of others. When I feel like roaming around the interwebs for yummylicious places that might be up my alley, I actually look up Winterlicious and Summerlicious listings and menus and jot down notes! And I mean actual notes, as hastily scrawled as they are. I have a page in my Muffymade notebook with scribbles of places I want to revisit, a page dedicated to places I want to nosh at in the near future, random photos of places to keep in mind when I’m in a hurry and can’t whip my notebook and pen out, and a word document saved on my computer specifically devoted to “places of interest” taken from past Winterlicious and Summerlicious listings. I think to myself, if the menus during the price fixe events intrigued me so much that I was compelled to take notes, there has to be something of substance on the regular menu and these places are probably something pretty special. And that’s how I felt about Hank’s. 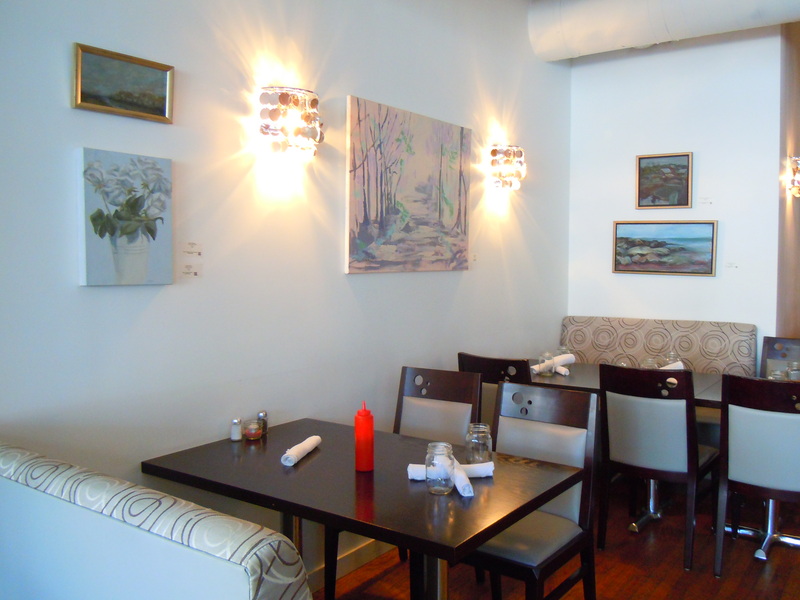 Hank’s is a fresh and lovely breakfast and lunch diner, located on Church St. just south of Front St. East and sandwiched between Wine Bar and Great Burger Kitchen. 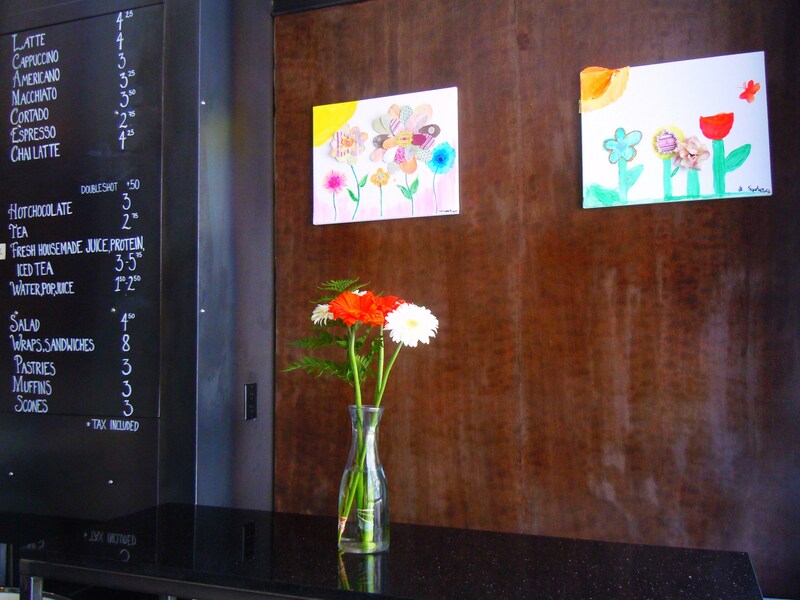 The restaurant is used to hold private functions and parties in the evenings, but it’s best to call them in advance to see what their hours are as I noticed a note on their chalkboard when I went about a change in evening dining hours. 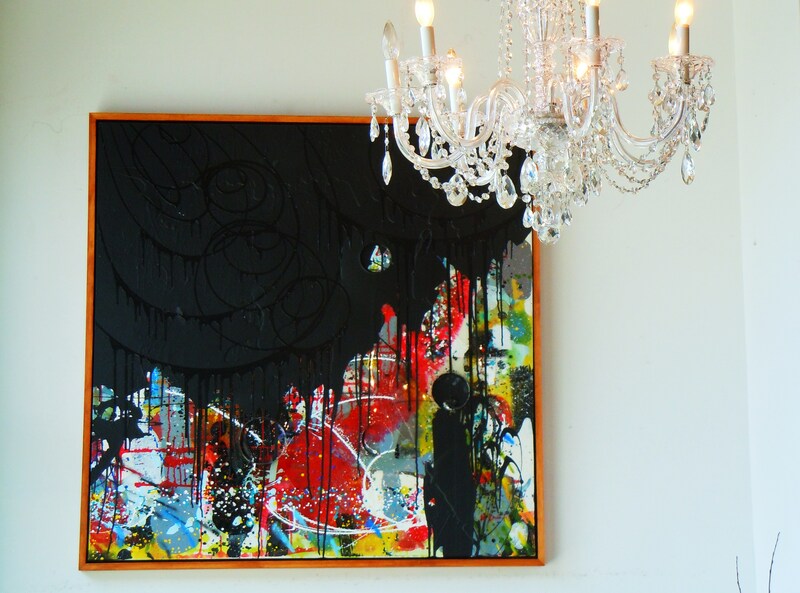 Hank’s is crisp, clean, and kind of like a breath of fresh air with their open French doors, and white and gray decor with pops of red and shimmering chandeliers and lights. 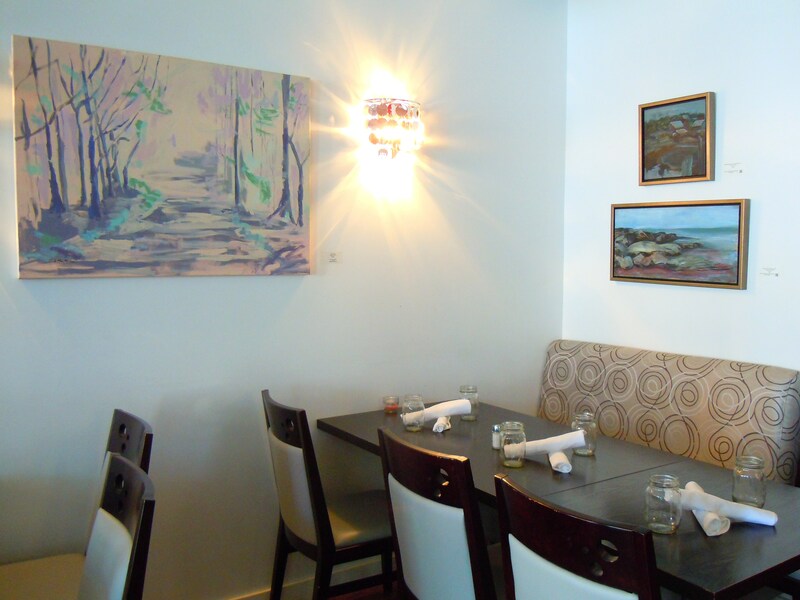 The diner is spacious and roomy with more intimate booths and table further into the diner for intimate social gatherings, a few bar tables and stools for those having a drink, and two tables beside the open French doors with cushy seats and round tables for that perfect breezy lunch. It’s exactly like being out on a nice patio with the fresh air without actually being outside. 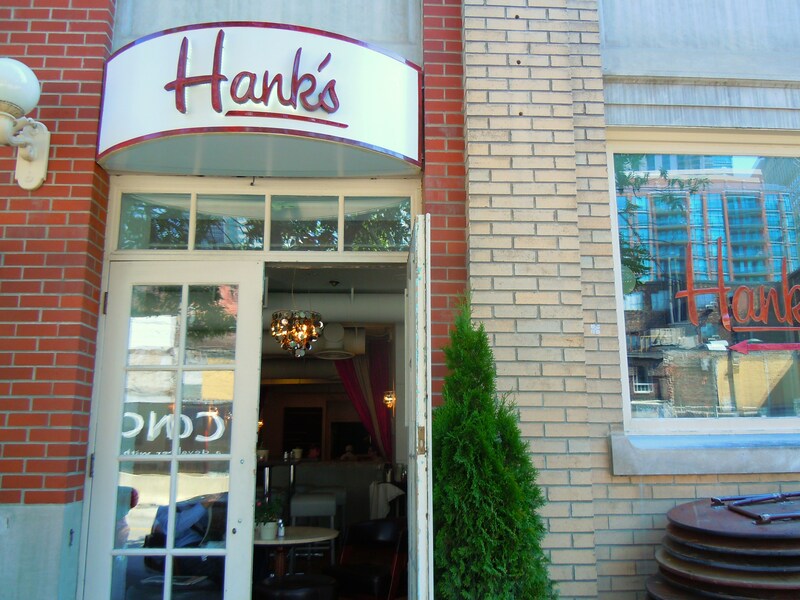 I was so curious about Hanks’s from the Winterlicious and Summerliciuous appearances that I looked them up and browsed their regular menu online. To my delight, there was a ton of food totally worth going for on a regular non-Winter/Summerlicious day including their weekday breakfast menu and large weekend brunch menu, as well as a host of lunchtime sandwiches and other diner eats. Prices for lunch will probably run you an average of $6-$10 (before taxes), and brunch floats around the $7-$11 mark. I can’t blog about this just yet, but for non-vegetarians and vegans (basically carnis) you absolutely MUST order the smoked chicken poutine. It will change your life. But, more about that another time! I know, I’m a tease. What’s really nice is that a number of their sandwich lunch items come in half portions at, obviously, a lesser price. Granted, even though getting a whole portion would be more worth your money, it’s great for people like me and others who want to try more than one item but can’t eat two full portions or can’t afford paying for two at full price! I was lucky because the two menu items I was contemplating on having had that option, so I chose the mushroom and goat cheese wrap and the deviled egg salad sandwich. Win-win! The tortilla wrap was awesomely grilled and it was stuffed with tons of juicy, fresh vegetables. It was so full of crunchy spinach leaves (there was probably a very generous fistful in it), sweet red onions (not raw but pickled, so they were soft red onions that had less of that spicy bite), and soft juicy red peppers and plump mushrooms with creamy goat cheese. I loved both of my lunch items but if I had to choose a favourite, the deviled egg salad sandwich knocked it out of the park. 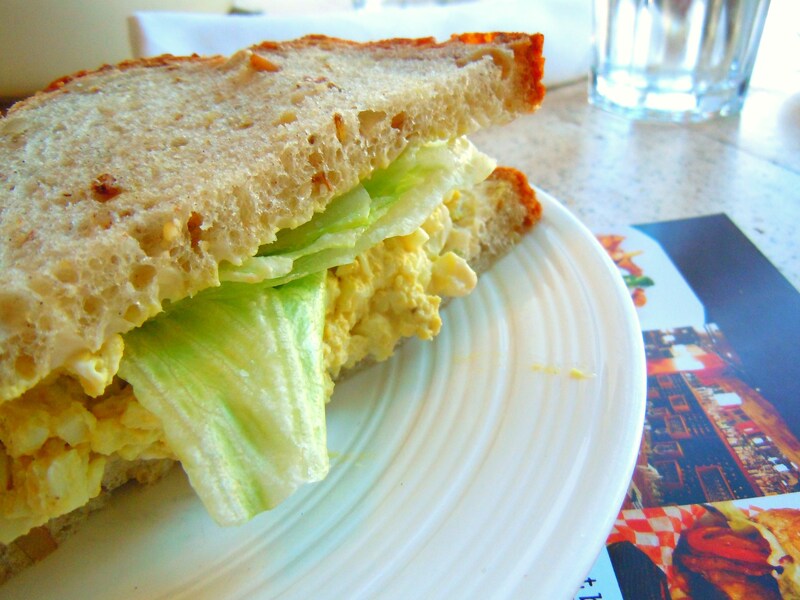 This is not your ho-hum egg salad sandwich in your old kiddie lunch box. This egg salad was SO flavourful and so delicious. When I read the description, it sounded great but I had my reservations. Not because I thought it wouldn’t taste good, but because I was unsure how the curry and paprika flavours would play out. I was afraid that the flavours would be too subtle and that it would end up getting lost, thus reducing my egg salad sandwich to ho-hum status. When something says curry, you expect that great punch of flavour. This sandwich was so not ho-hum. I could eat an entire mixing bowl of this egg salad because it’s that good. The mix of spices is so perfect and when I bit into it each time, the flavours were reminiscent of the savoury curry sauces I loved so much from Indian and Chinese places. The lettuce added a great dimension of crunch and the bread…oh the bread. Delicious stuff. 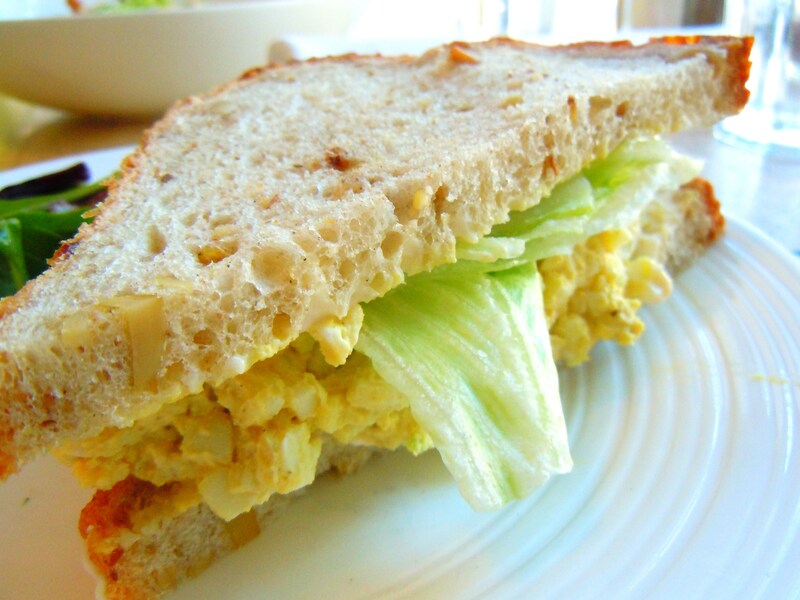 Hank uses Fred’s Bread and for the egg salad sandwich, they used Fred’s whole grain variety. The neighbourhood Hank’s is located in is super convenient because it’s just steps away from the St. Lawrence Market and the “greater” downtown core, and walking distance from Union Station making it easily accessible by public transit. The atmosphere is great and I’m so glad my ridiculous note-taking paid off because I have found myself (and others, if you’re interested in trying them out!) yet another wonderful breakfast and lunch spot that I can’t wait to go back to. 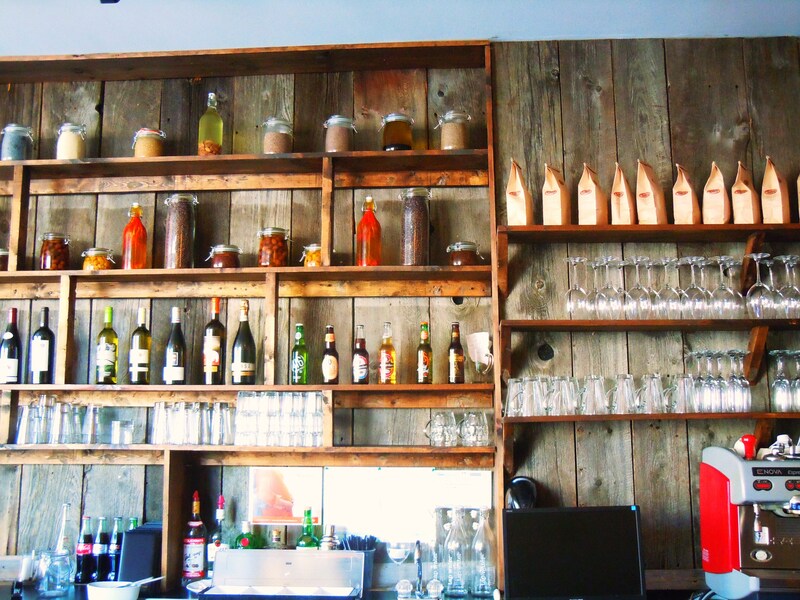 Hank’s is located at 9 1/2 Church St. (no, that’s not a typo, 9 1/2! ), just south of Front St. East. 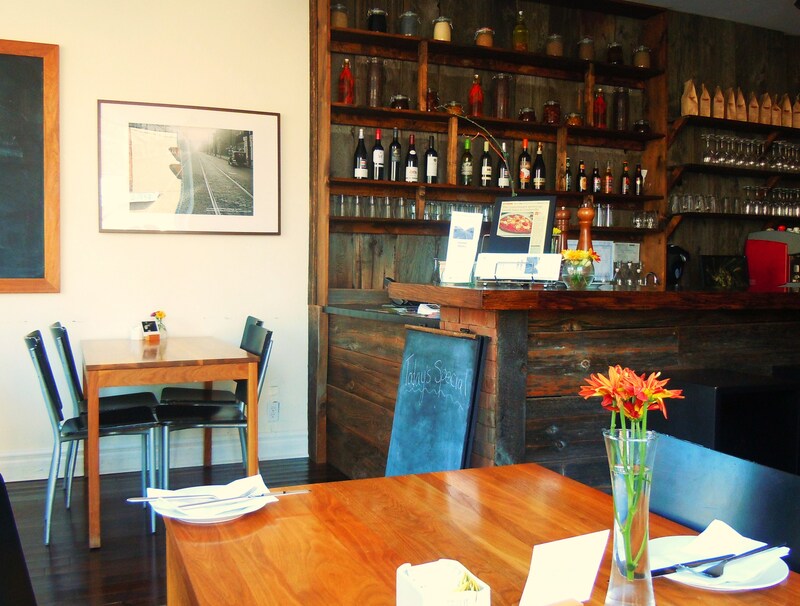 They are open for breakfast and lunch 7 days a week and offer a weekend brunch menu on Saturdays and Sundays. They are open from 7am-5pm on weekdays, and from 8am-4pm on weekends. Call them if you’re interested in dining there for dinner as they have changed their hours for the evenings. 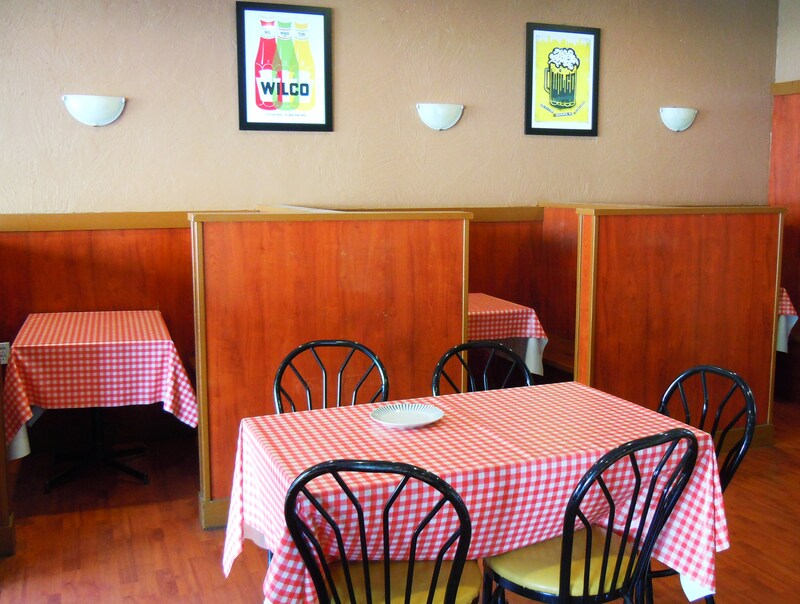 The diner is also available for private parties and corporate events. 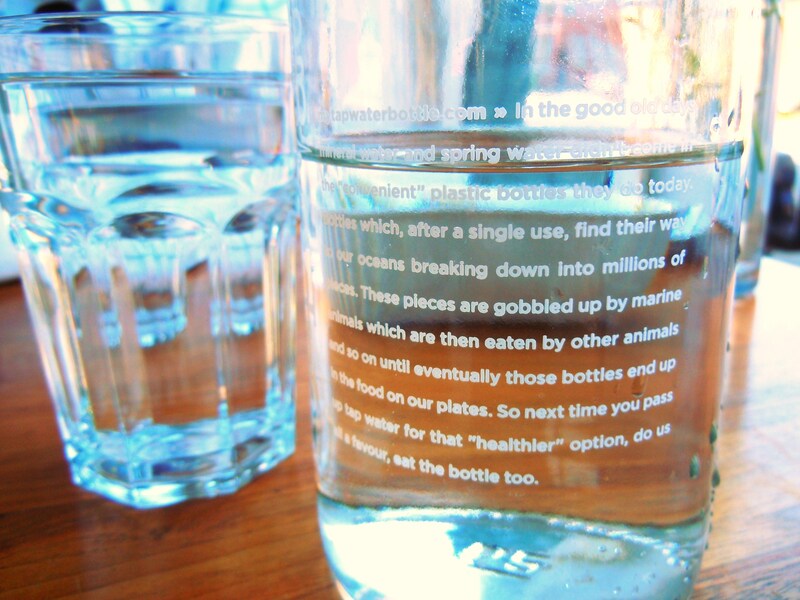 Click here to view their website and menus.